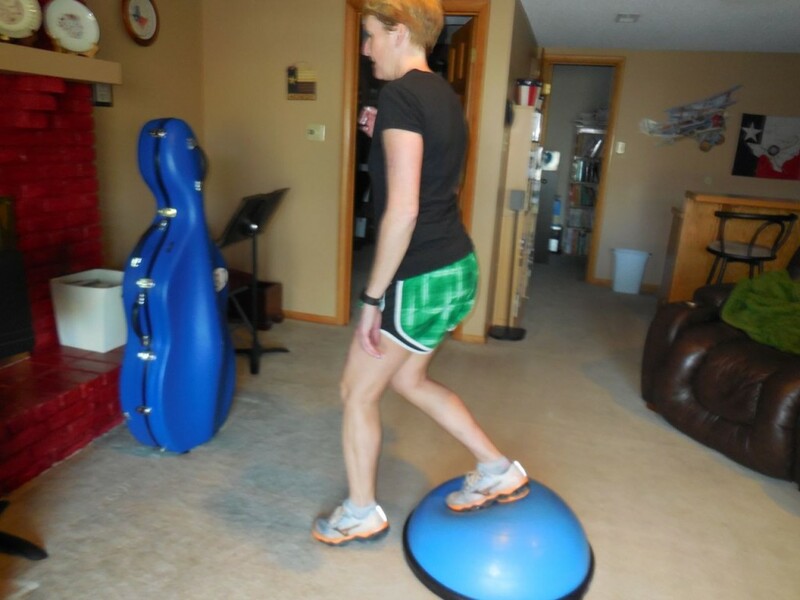 This week I used a variety of pieces of equipment and other workout “toys” for some of my moves – always fun to use items in different ways!! 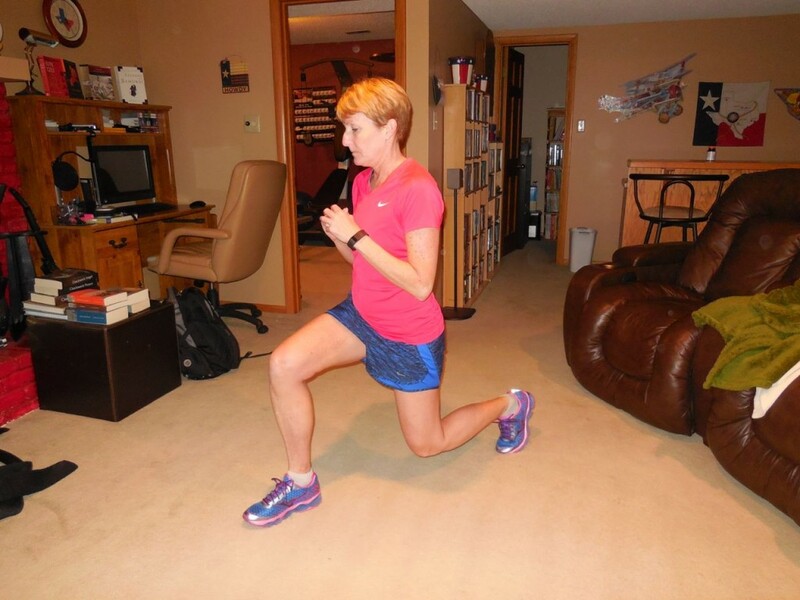 Sunday 4/5 – 45 cross behind lunges (curtsey style) off of step – plyo move. Push off and hop back to top. 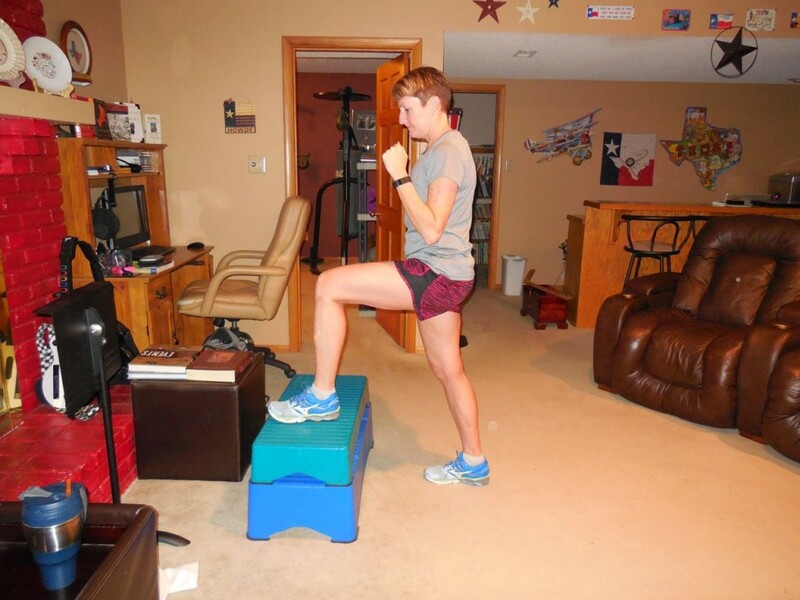 I need to start incorporating more plyo moves into my workouts again!!! 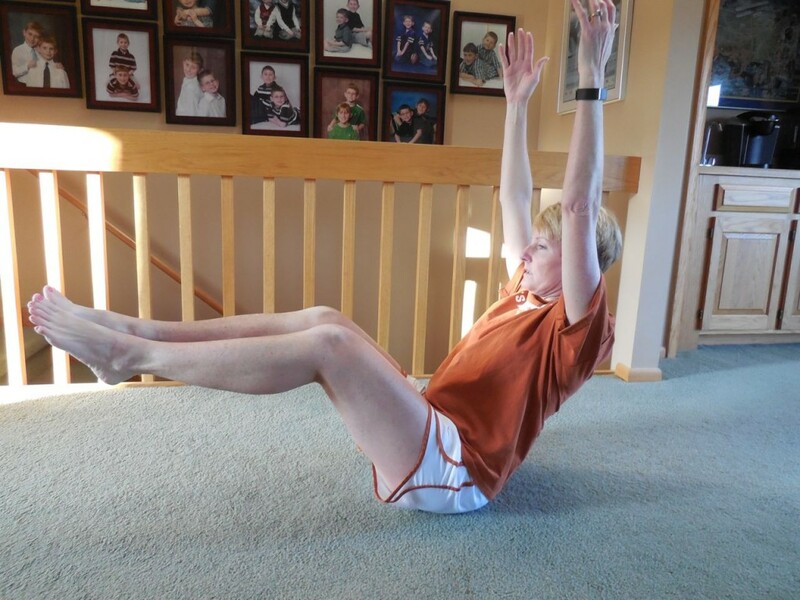 Monday 4/6 – 45 double step – plank jack/tricep push-up. 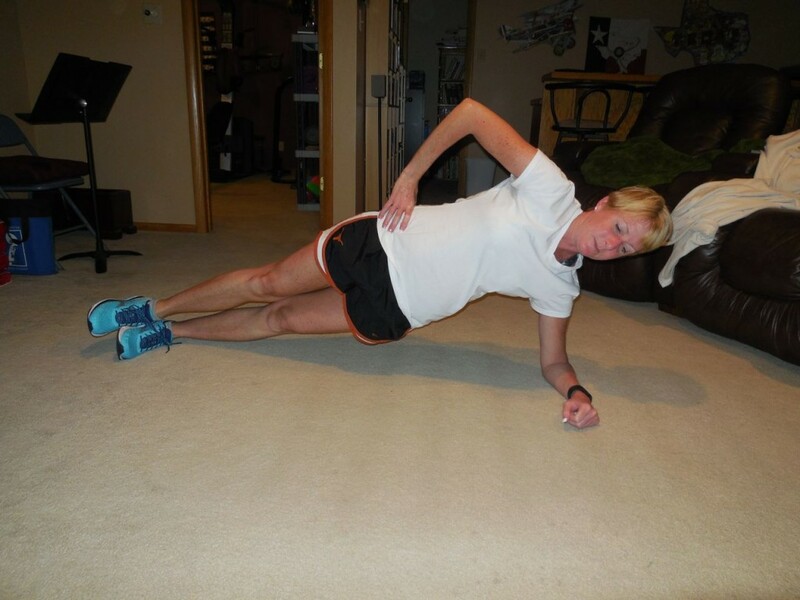 This move was hard – the tricep push-up is what killed me!!! I ran 10 miles (74:28) followed by an easy mile. 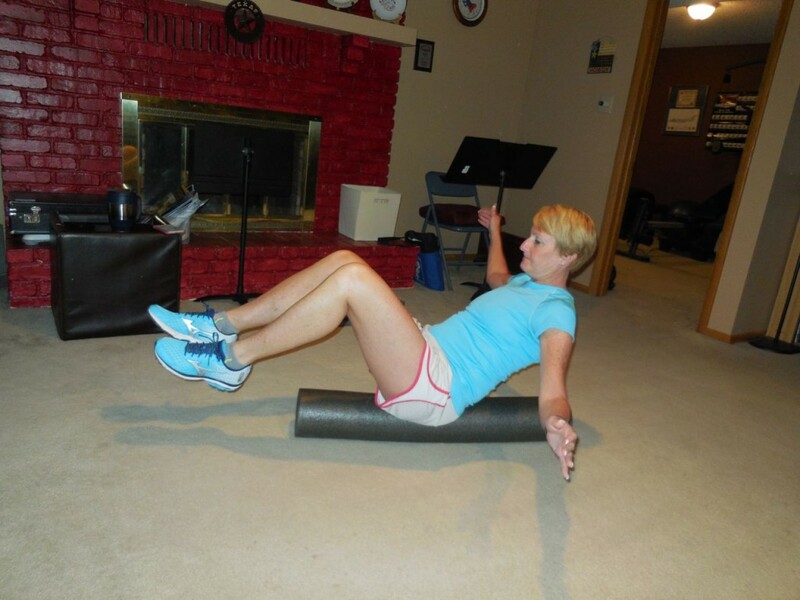 Tuesday 4/7 – 45 V-sit on vertical foam roller with open/close arms. 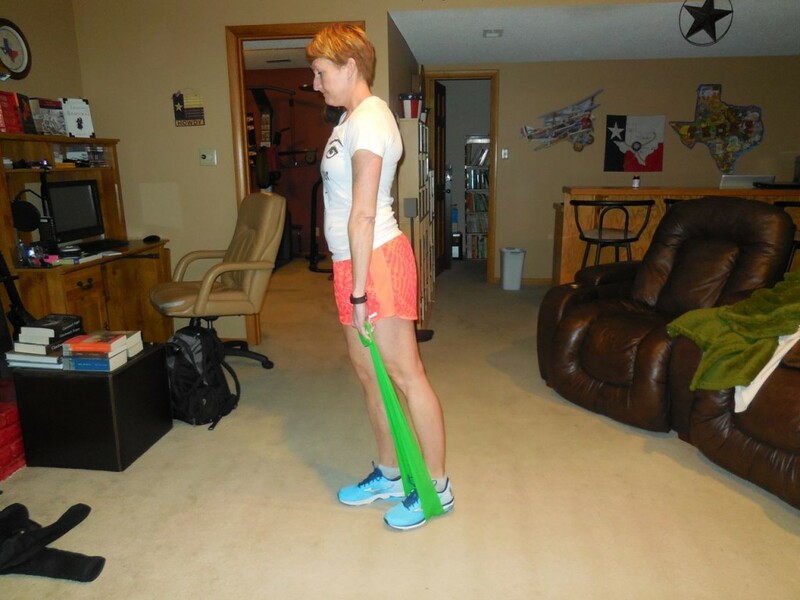 This move is a variation of a move from Lindsay (Cotter Crunch) and her 3 New Core Moves – she did the move as a stationary move focusing on holding. I knew I couldn’t do 45 long holds so I adapted it. This move might look easy but it was HARD!!! 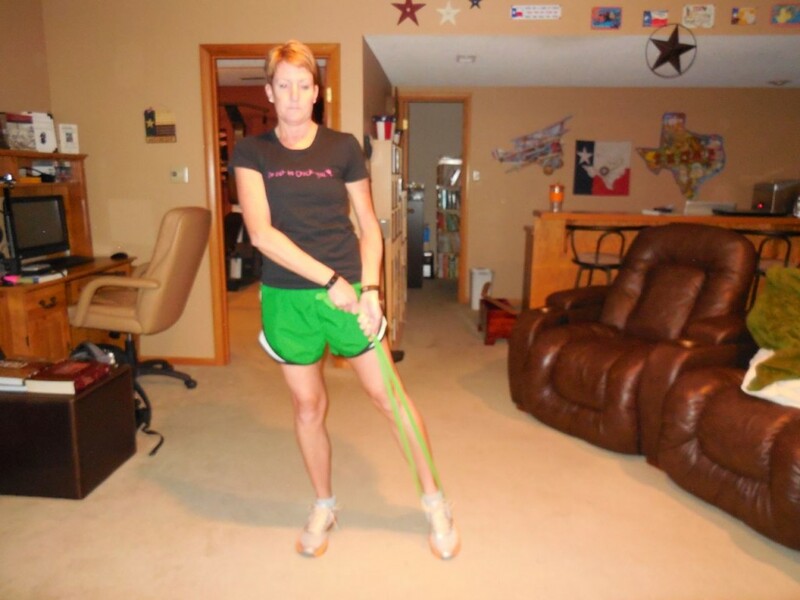 I did Denise Austin’s Personal Training DVD – always a fun workout for the entire body!! 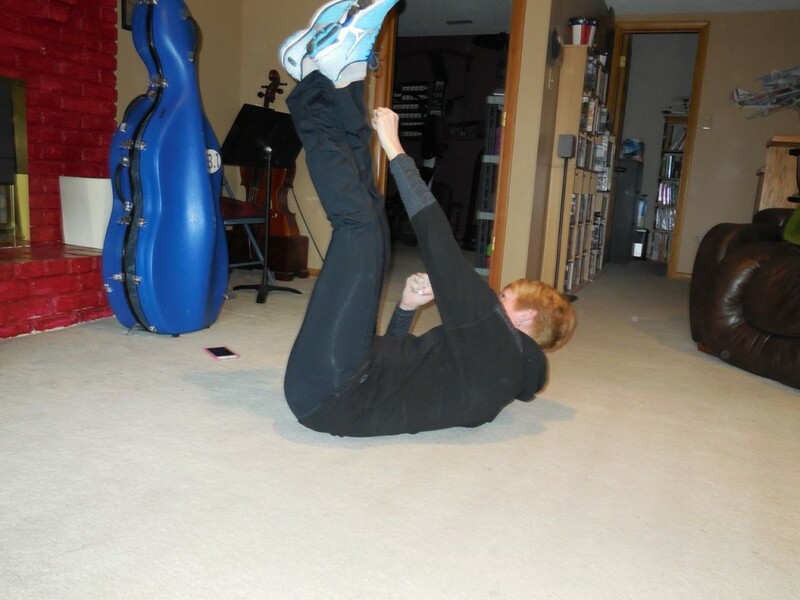 I even did the stretching segment!! Wednesday 4/8 – 45 hinged barbell pulls. The key to this move was keeping everything still except the arms. I only had time for 6 miles (44:17) followed by a cool down mile. 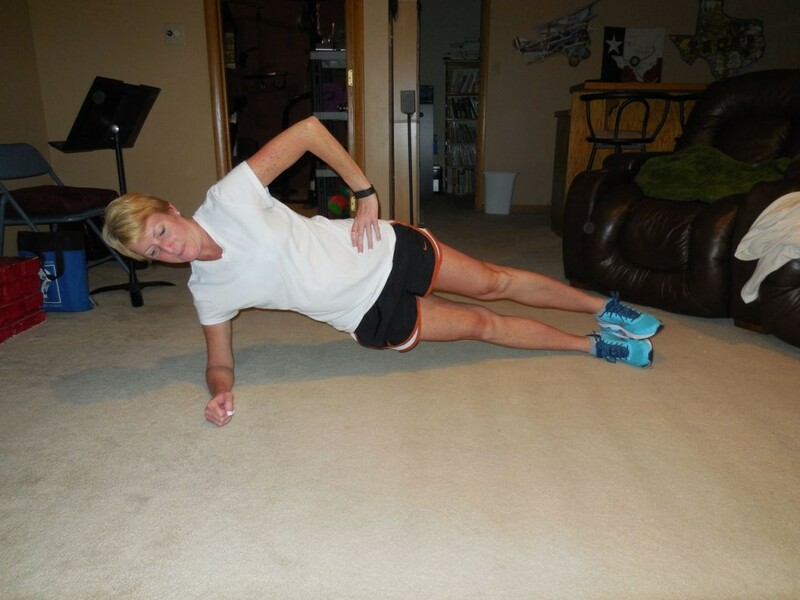 Thursday 4/9 – 45 side plank with a leg sweep front-back-front. 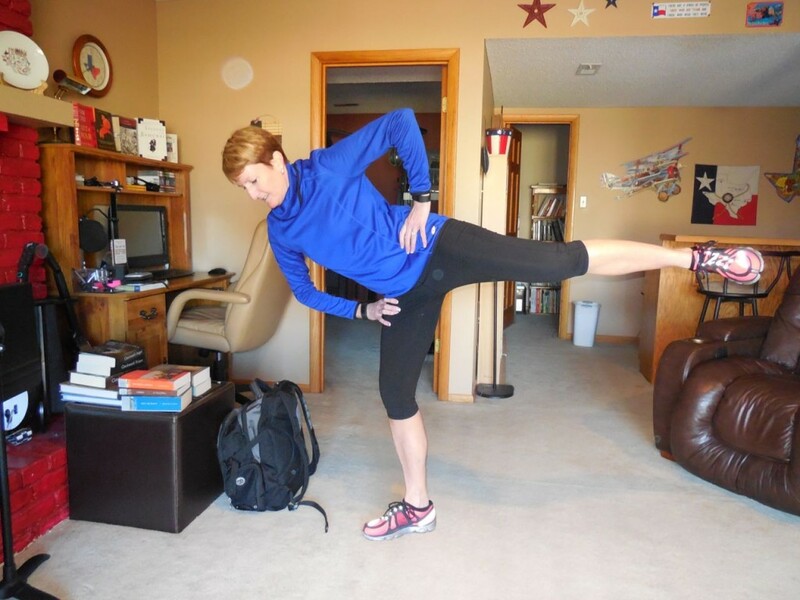 Move the top leg back to the front to complete the rep. 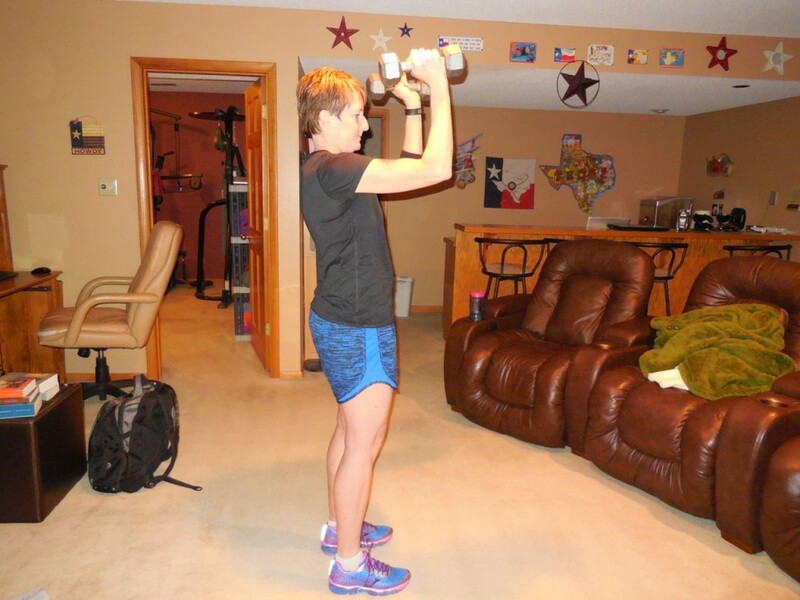 This took longer than I expected – I had to pause a couple times before completing all 45 reps. And, then I had to flip over and do some more! 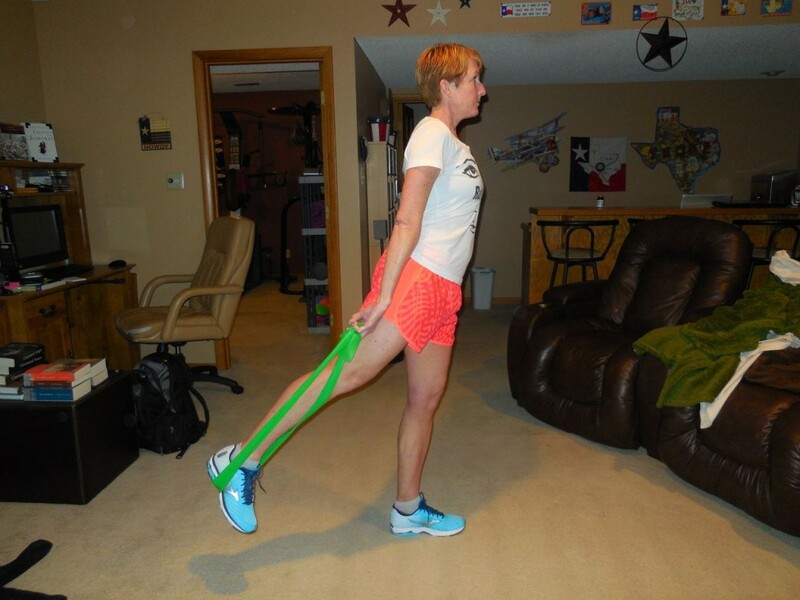 Bring that leg to the front to complete 1 rep! I guess I didn’t use any cool “toys” for this move – oops!! 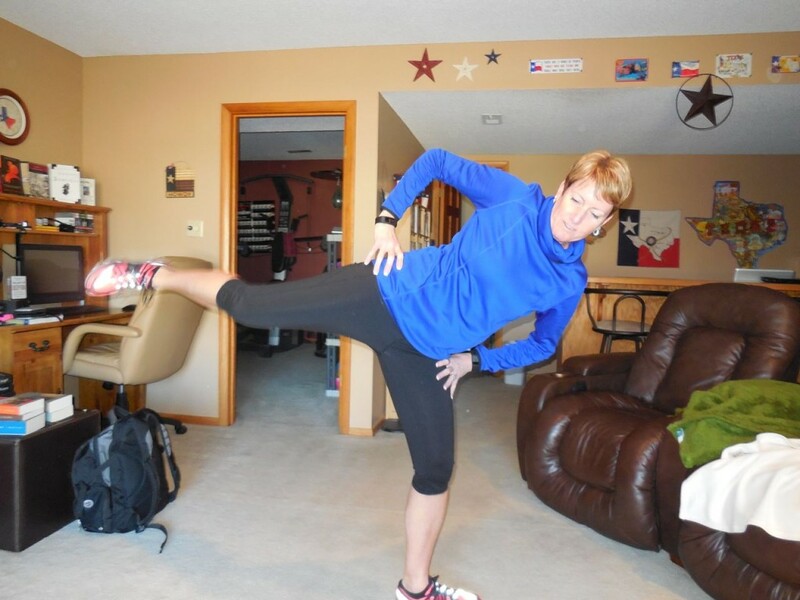 I did Les Mills Combat – Ultimate Warriors – 60 minutes of fast paced punching and kicking!!! 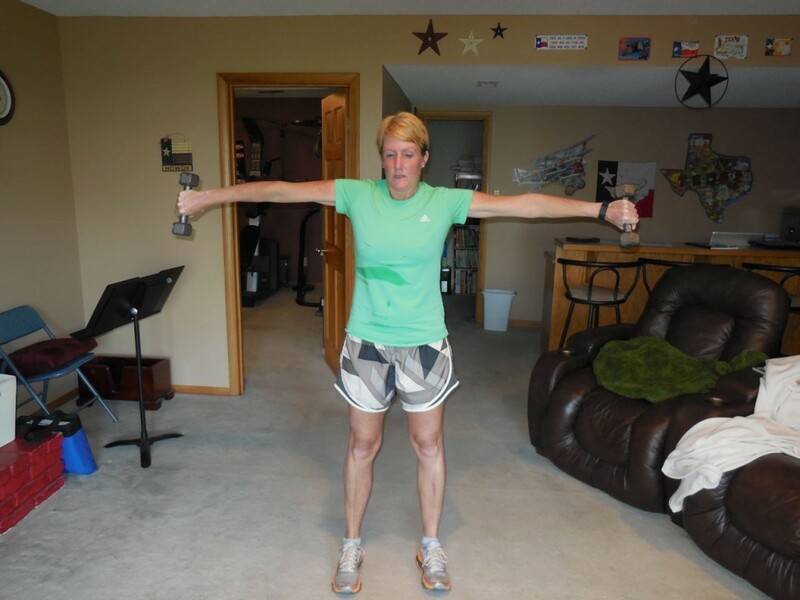 Friday 4/10 – 45 shoulder presses with a chair. I was a slug and slept till 6:00 so I didn’t get my workout done early. I had my 3rd day of cleaning/set-up at the venue for the past 4 so I decided to do my 45 once I got to the venue. 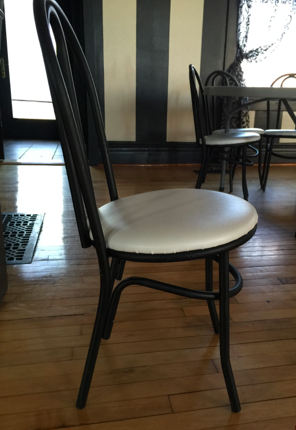 I used one of our chairs – I held it in front of my chest with both hands (by the front legs) and pressed my arms overhead before lowering to a 90 degree bend. 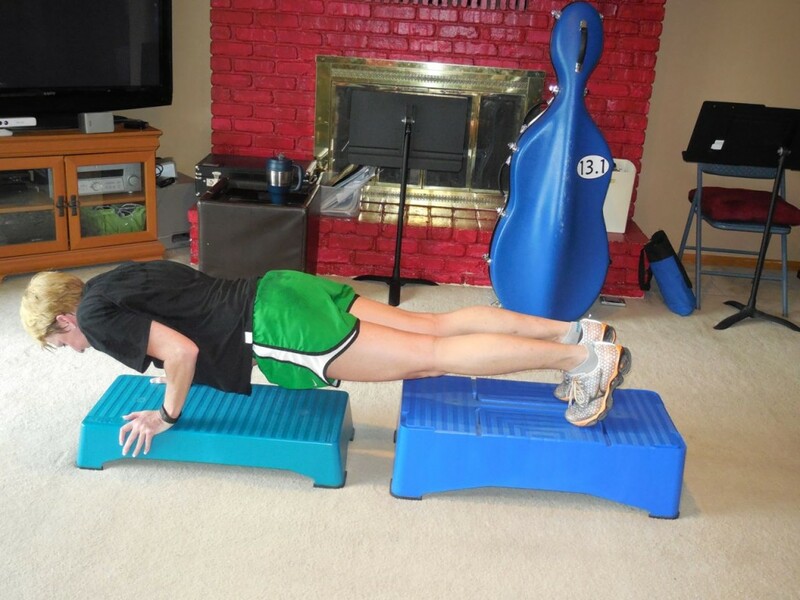 Sort of a fun way to work my shoulders!! Saturday 4/11 – 45 sidearm triceps extensions. 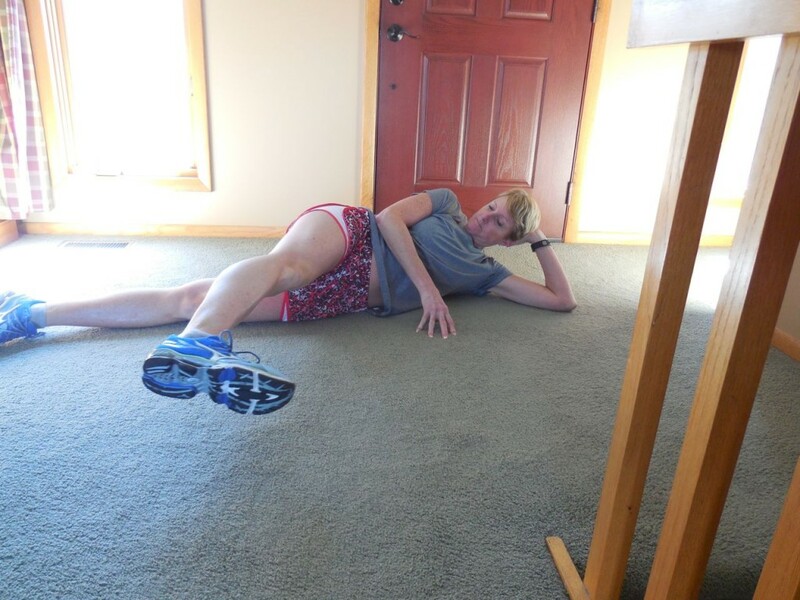 Can you tell the pictures are after my run? I put my shirt back on for them since I’m not super happy with my abs these days. I ran 10 miles (73:50) followed by 1.5 easy miles. 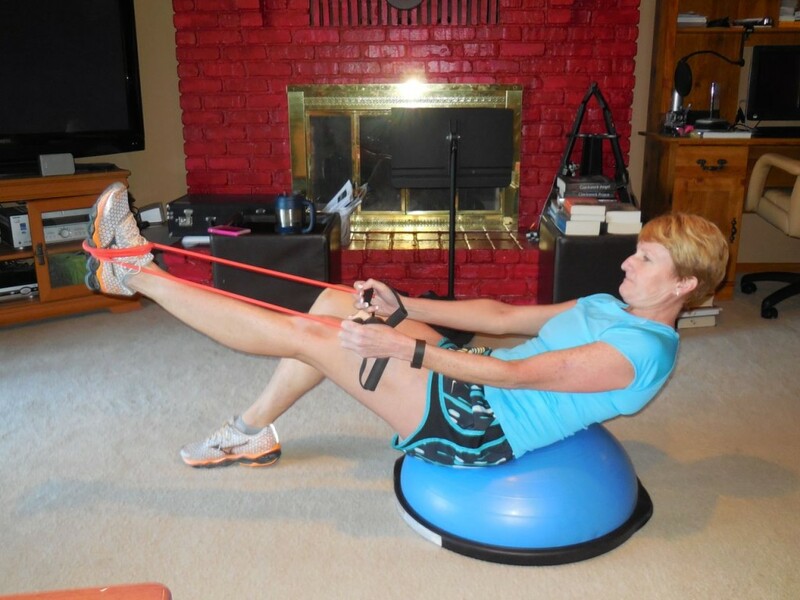 Do you like to experiment with new uses for standard equipment? 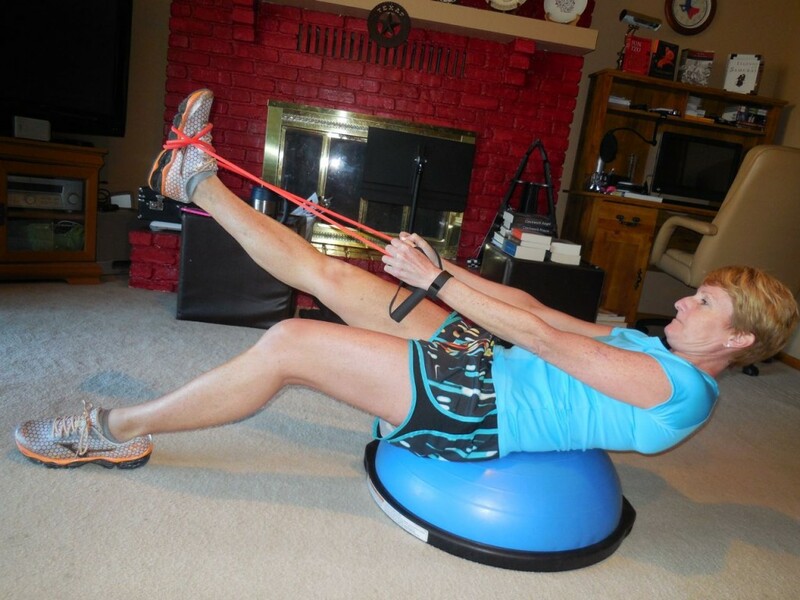 I like to use different pieces of equipment especially in new ways!!! 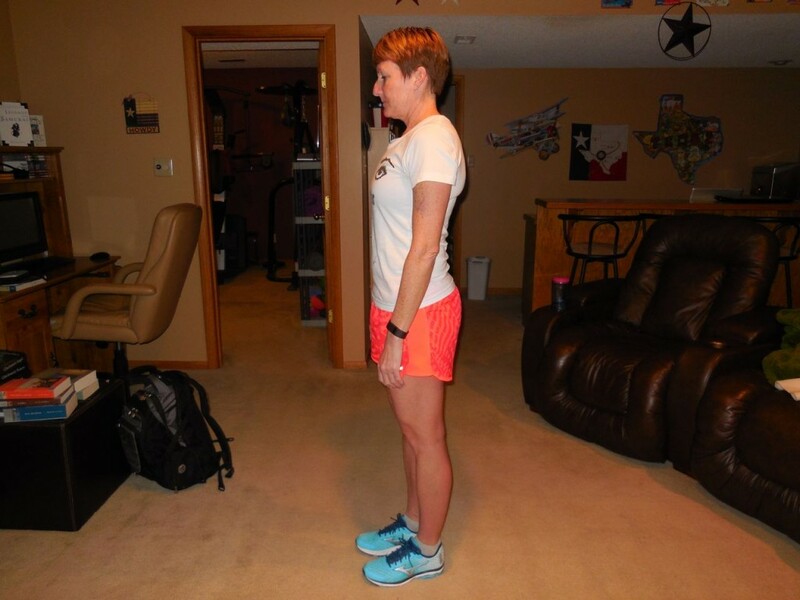 Race Day – 50 MILES!!! Today is race day – 50 miles!!! The week was very light because I’ve been trying to rest up some before running for hours. 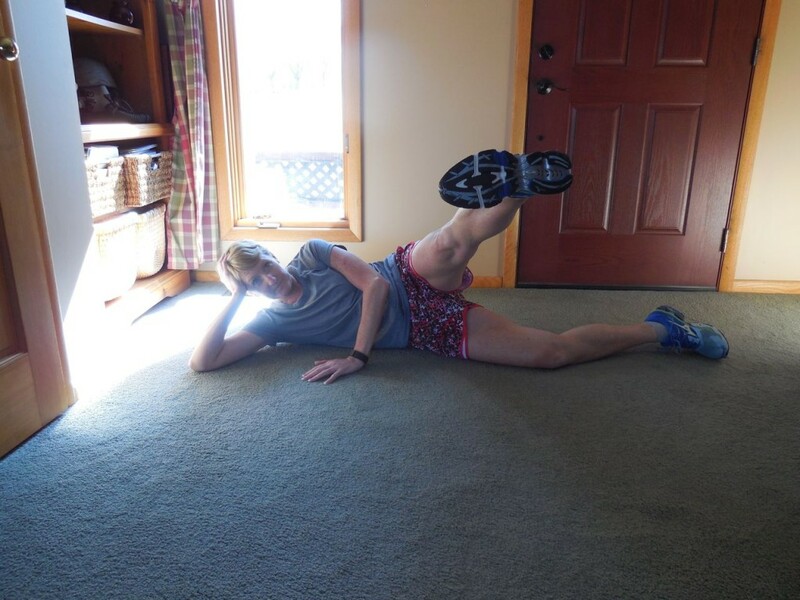 Sunday 3/15 – 45 side lying front leg pulses. I was laying in the sun because it was cold and I didn’t want to turn the heat back on! 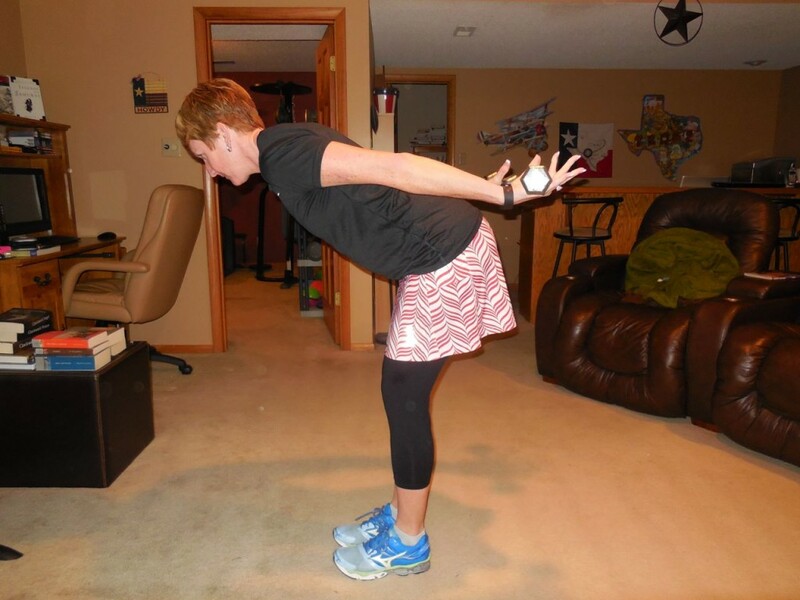 Monday 3/16 – 45 squats with knee lift across body – hands behind head the entire time. This move was really fun! 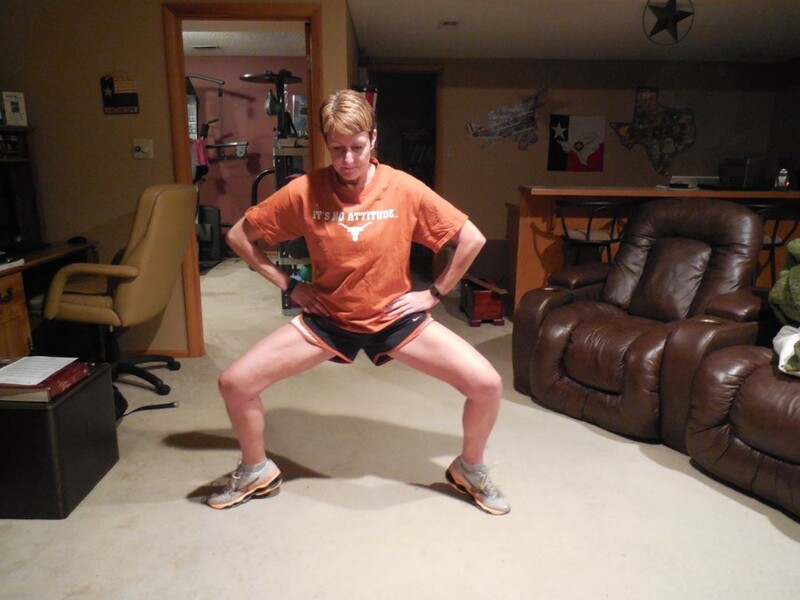 Since I counted a right & left knee raise as 1 rep I ended up doing 90 squats. 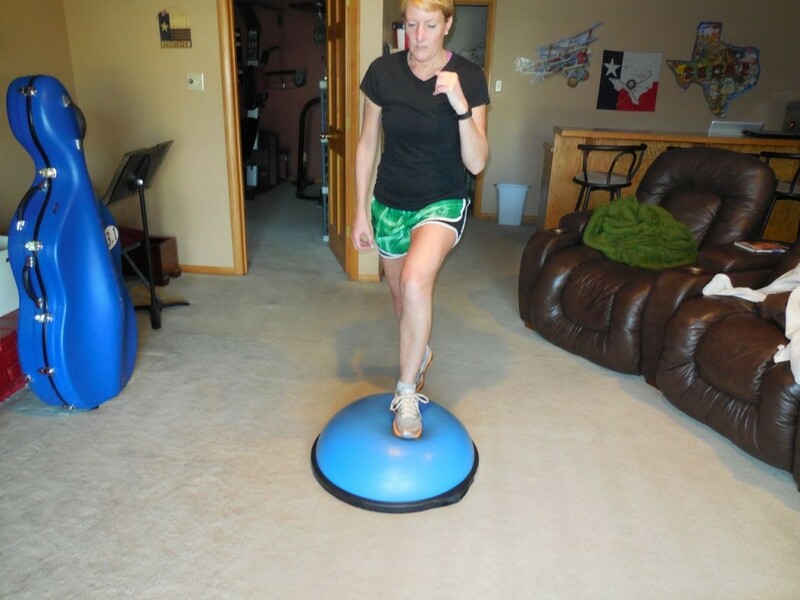 Tuesday 3/17 – 45 BOSU step overs. 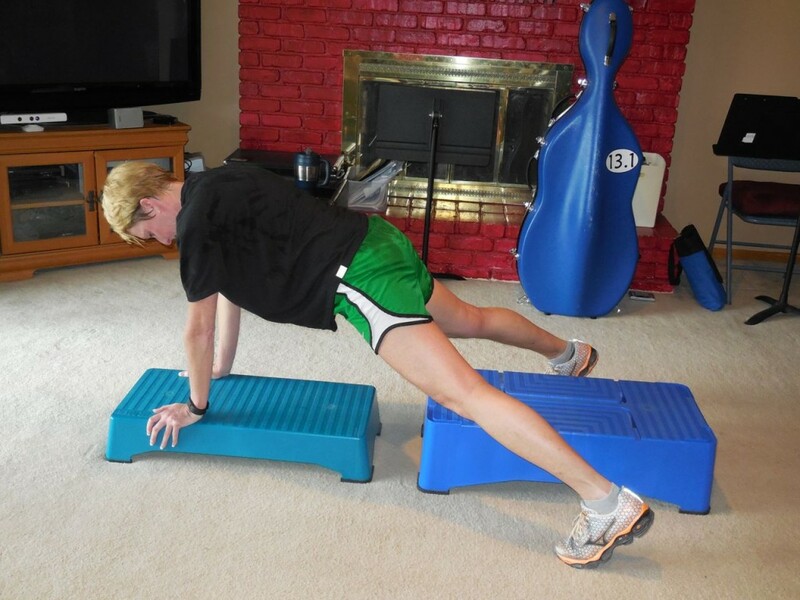 This move went quickly but my stationary quad was burning by the time I finished 45 reps (front-back-front). Time to work the other leg! Start front. 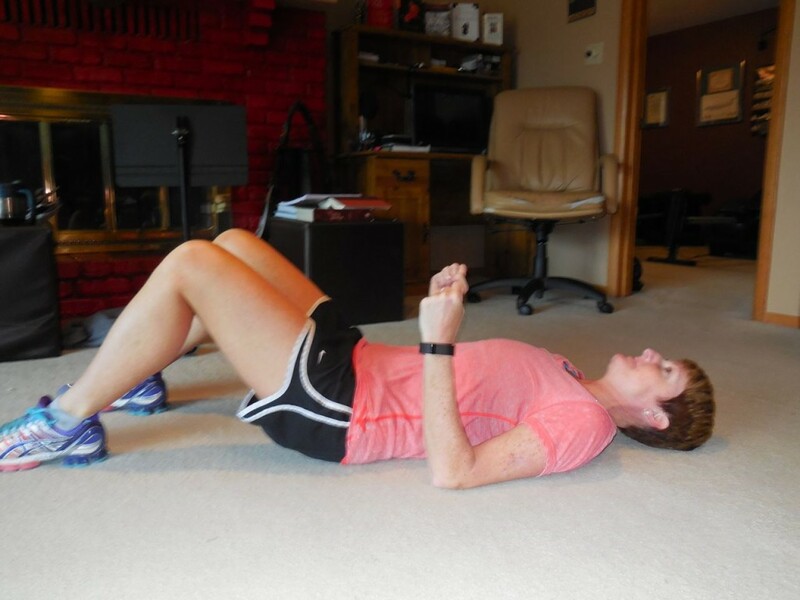 I did an easy 5 mile run – 39:23 followed by 0.35 easy miles. 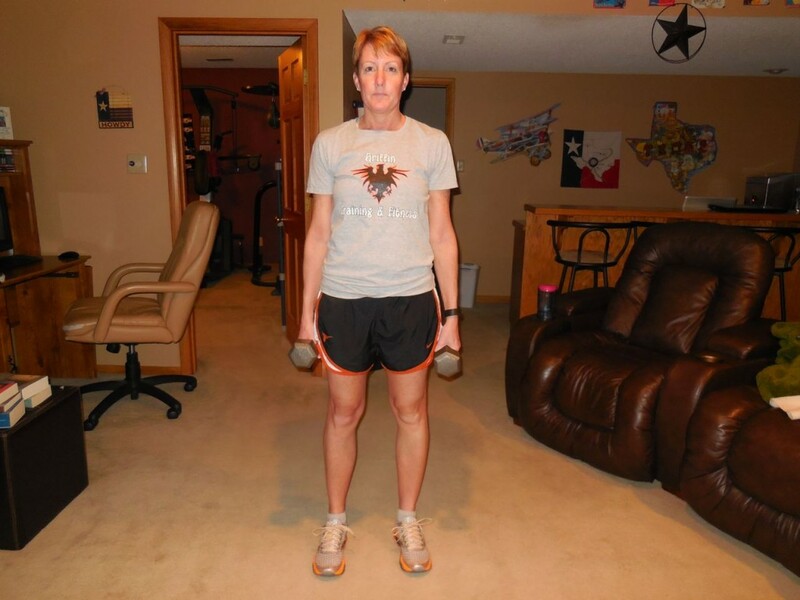 Wednesday 3/18 – 45 weighted pulsing lunges – set weights down, pick weights up. 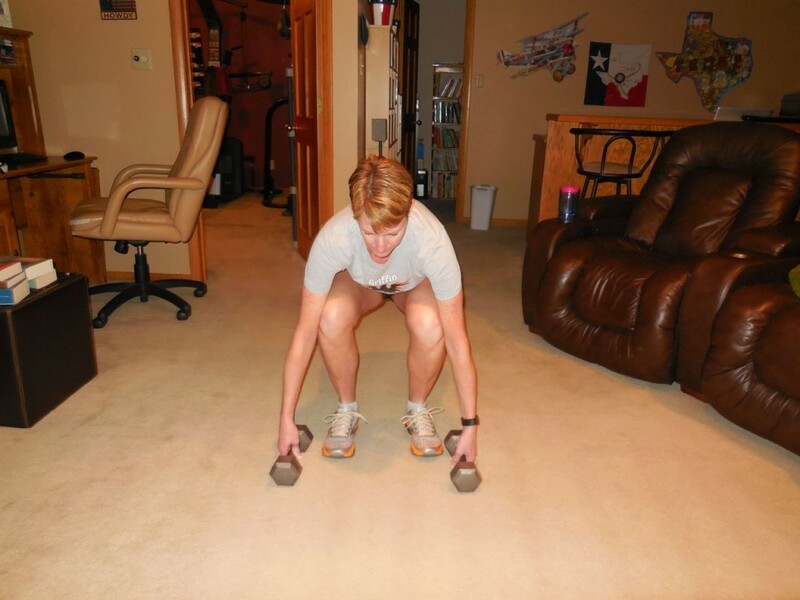 To complete the rep, go back down and pick up the weights. 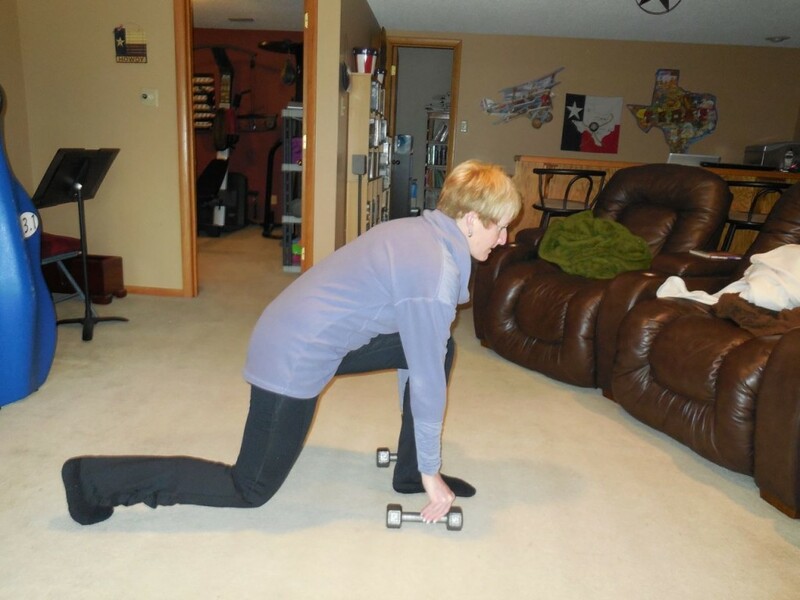 Umm….this wasn’t my best idea since it ended up being 90 lunges total on each side!!! 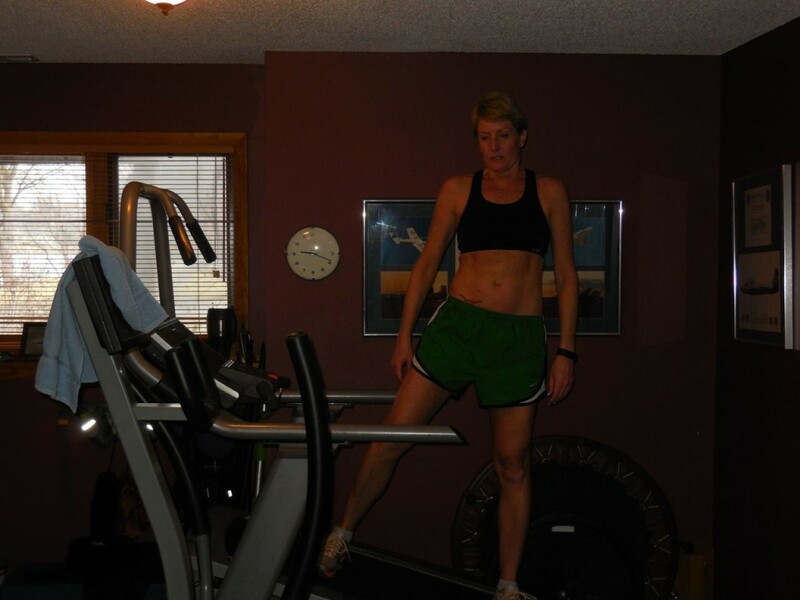 And, back down to get the weights to complete one rep!!! 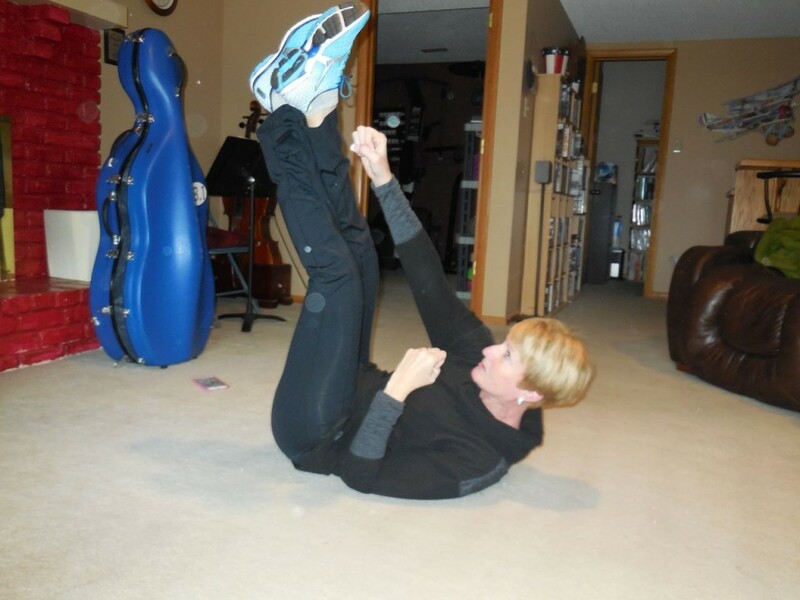 Thursday 3/19 – 45 oblique punches with legs up. 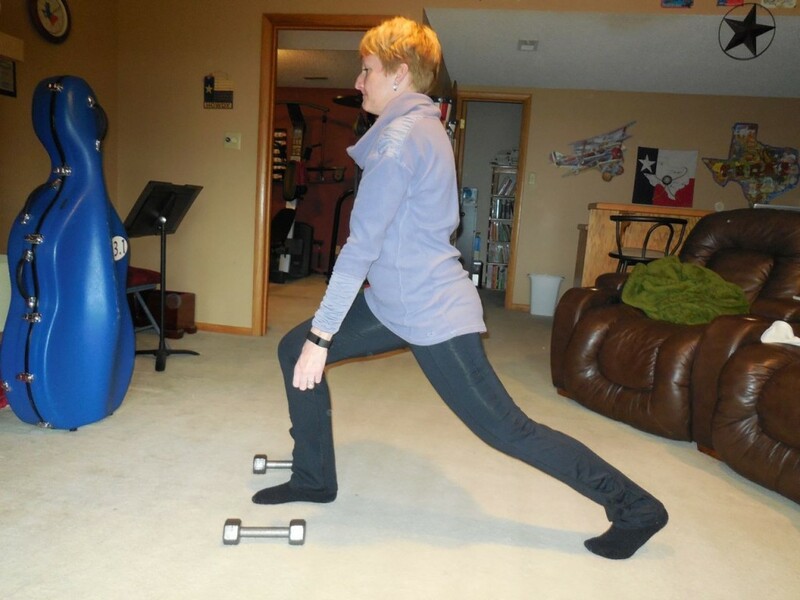 I liked this move – it was fairly simple!!! 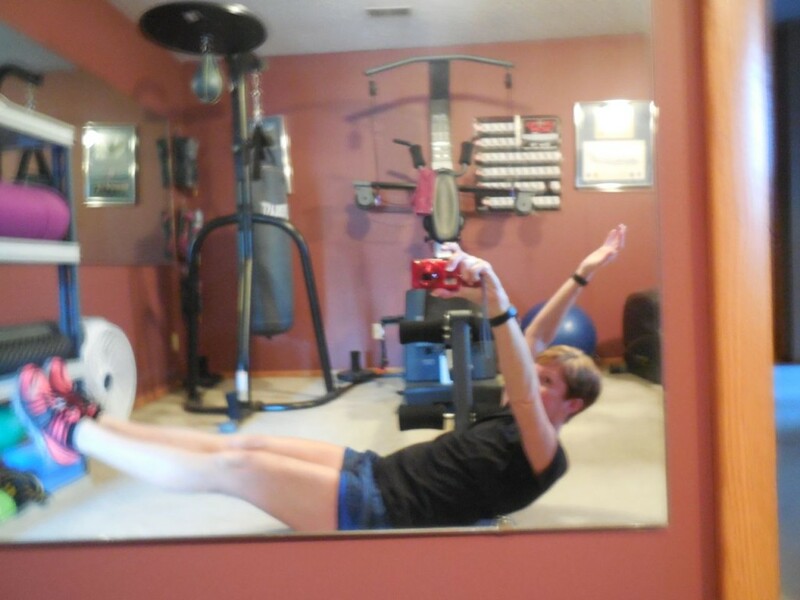 Friday 3/20 – 45 boat poses with moving arms (out in front – up). 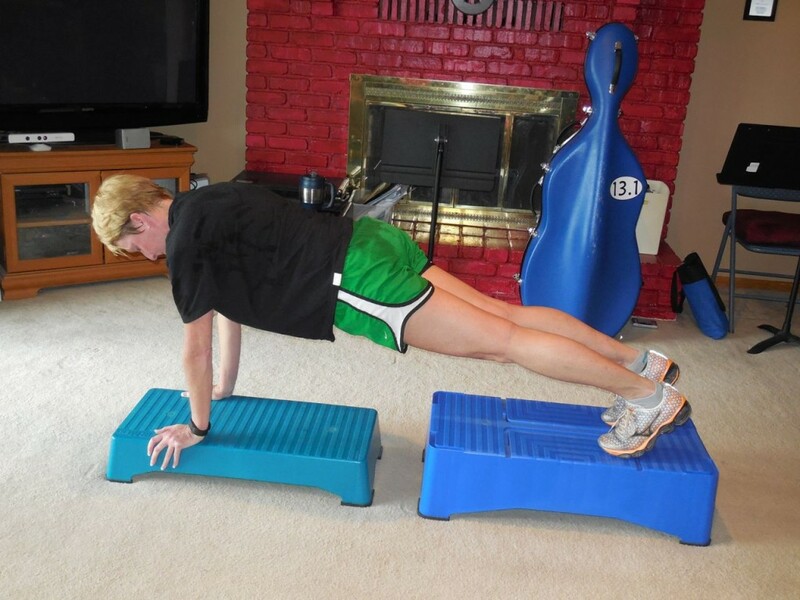 This was a great core challenge!!! 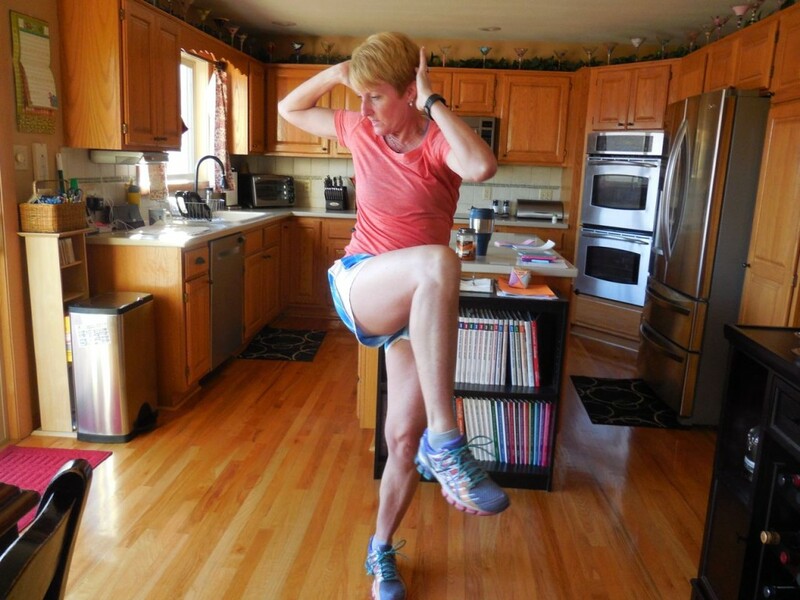 Saturday 3/21 – 45 quick back & forth calf pumps. 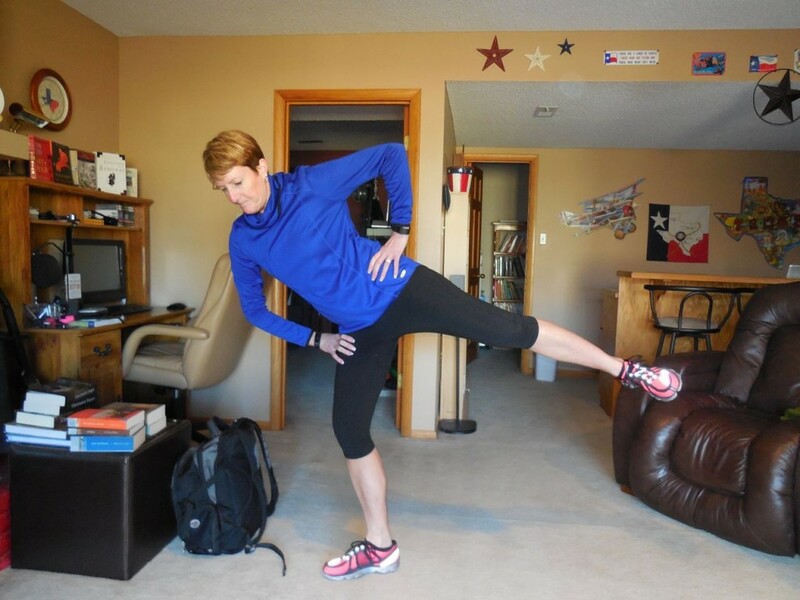 This was a quick back & forth move of my calves – a good stretch before my race. I took pictures of Hunter showing the move Friday morning before I left home so that all I had to do this morning was the actual 45. 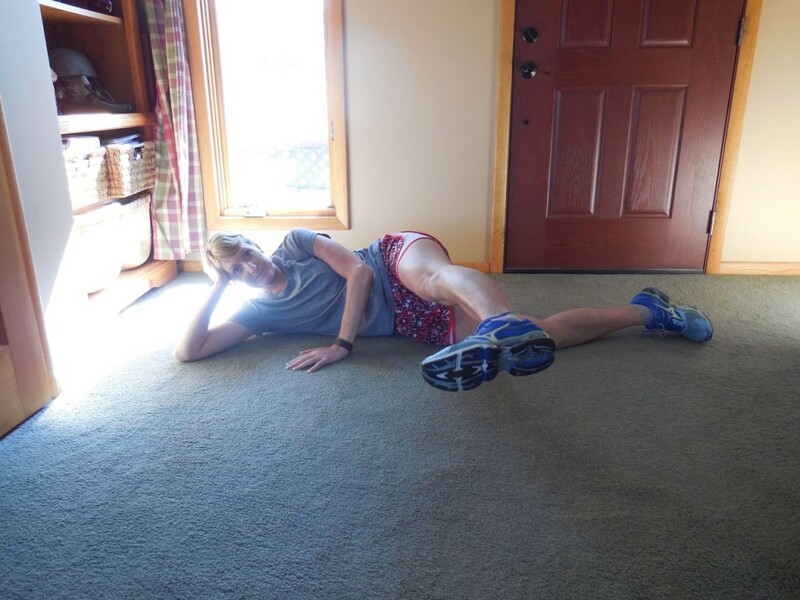 Now, I’m off to run 50 miles!!! This week I took several days off because my legs were tired and I’m trying to rest some before next Saturday! 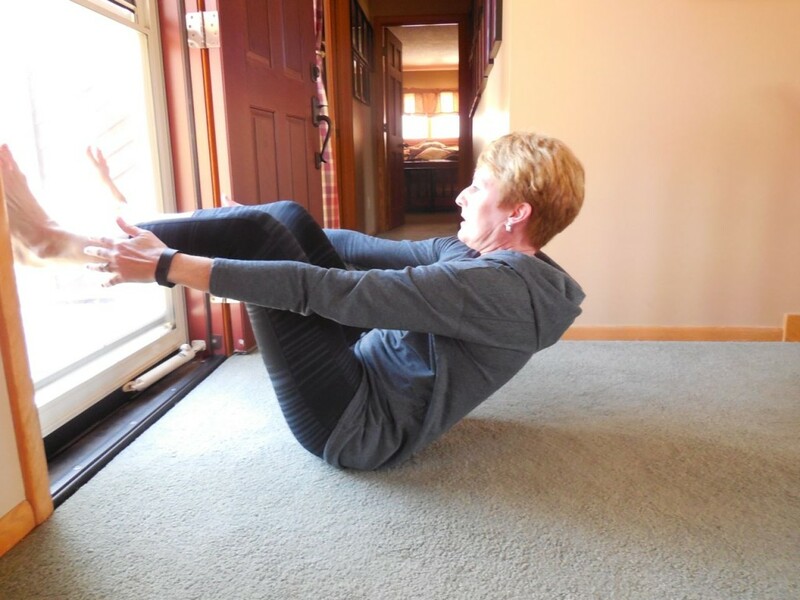 Sunday 3/8 – 45 sit-ups with my feet propped on the door. 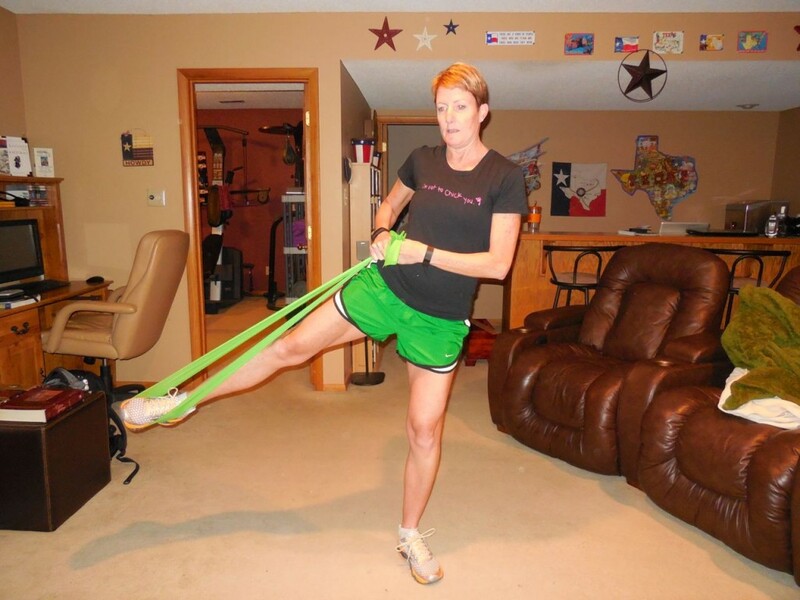 Monday 3/9 – 45 rear leg lifts with band. After one side has been worked over, it’s time to switch and hit the other side. 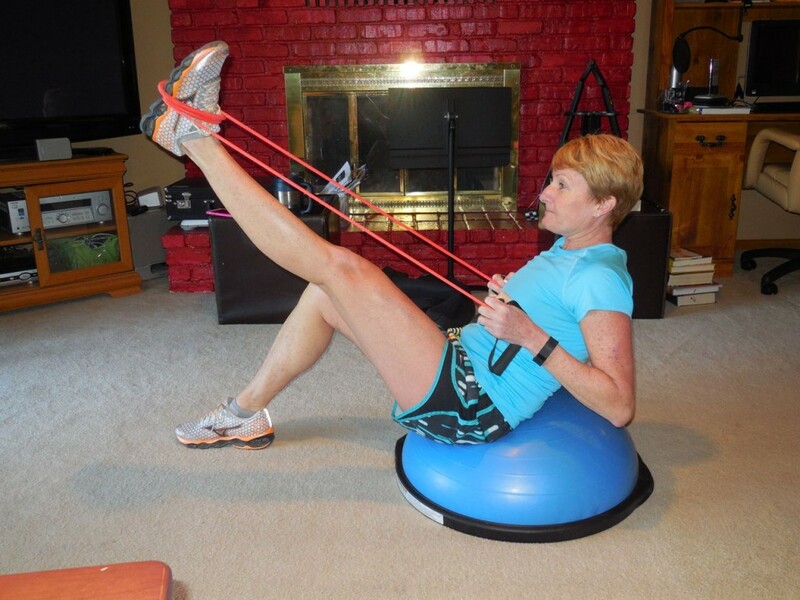 I did Turbo Jam – Lower Body Jam & Ab Jam – both fun workouts!! 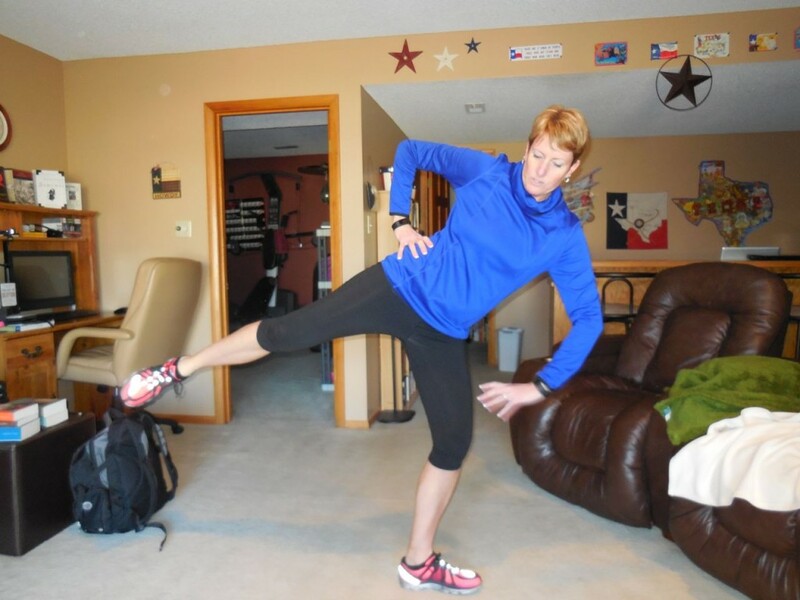 Tuesday 3/10 – 45 reverse lunge to warrior 3. 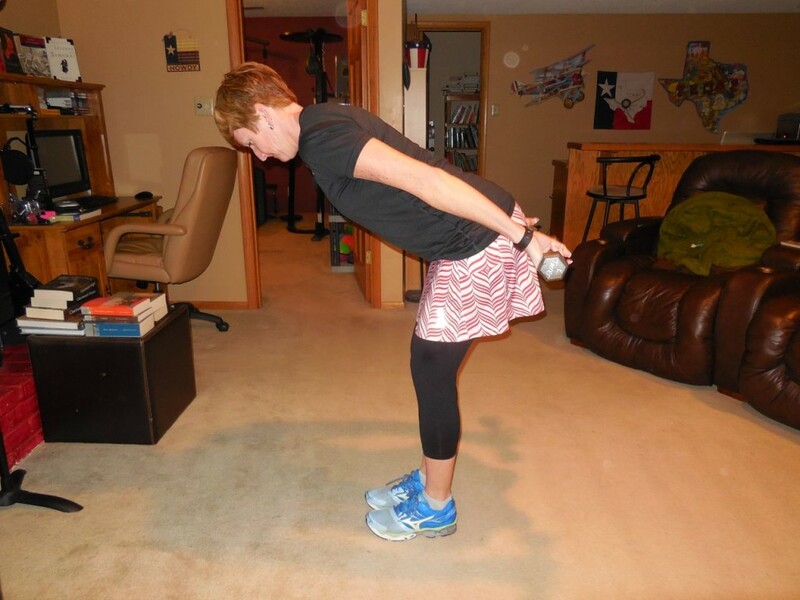 I love how many muscles are involved in these 2 moves. And the balance challenge always makes me happy!!! I did a 9 mile run in 68:35 followed by 1.2 easy miles. 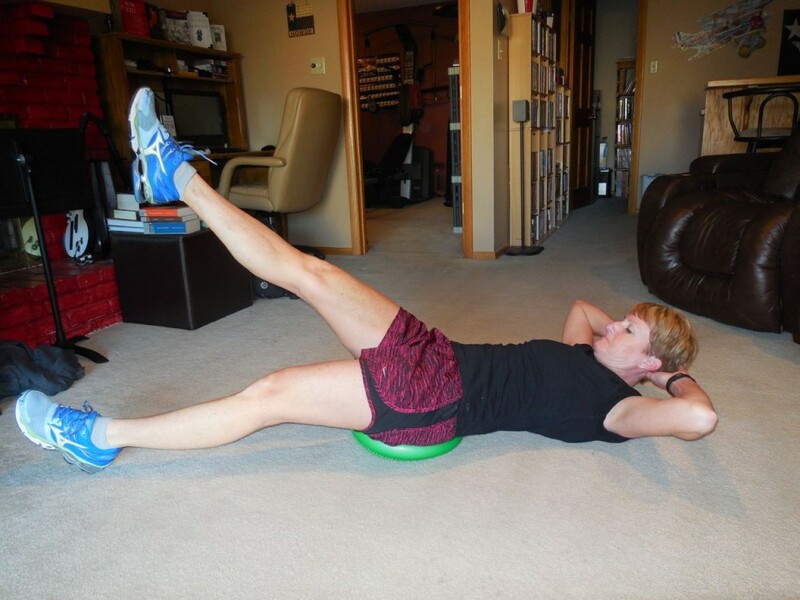 Wednesday 3/11 – 45 crunches with a medicine ball toss (8 pound). This was the start of taking a few days off since my legs felt tired. I still ended up with almost 20,000 steps after a day of cleaning and setting up at the venue. 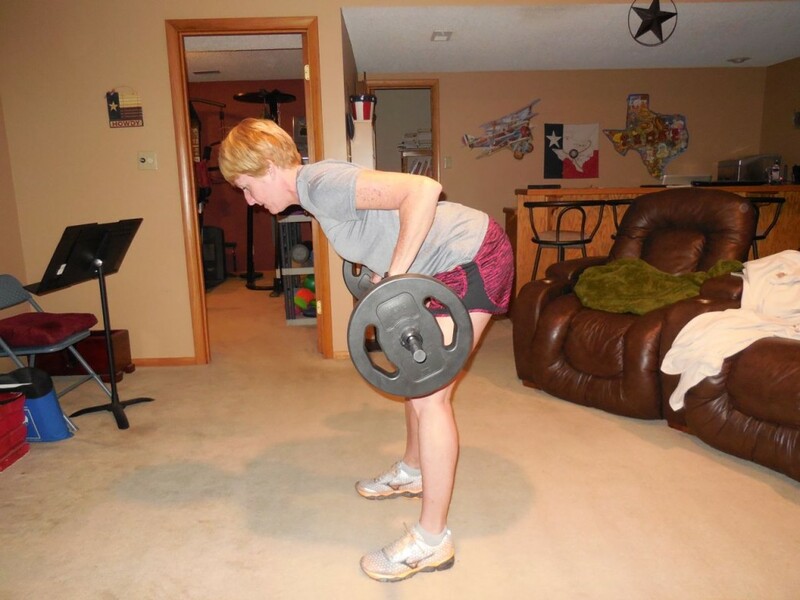 Thursday 3/12 – 45 bent over tricep pulses. An easy move on another day off (other than 8 hours on my feet while ironing table cloths). 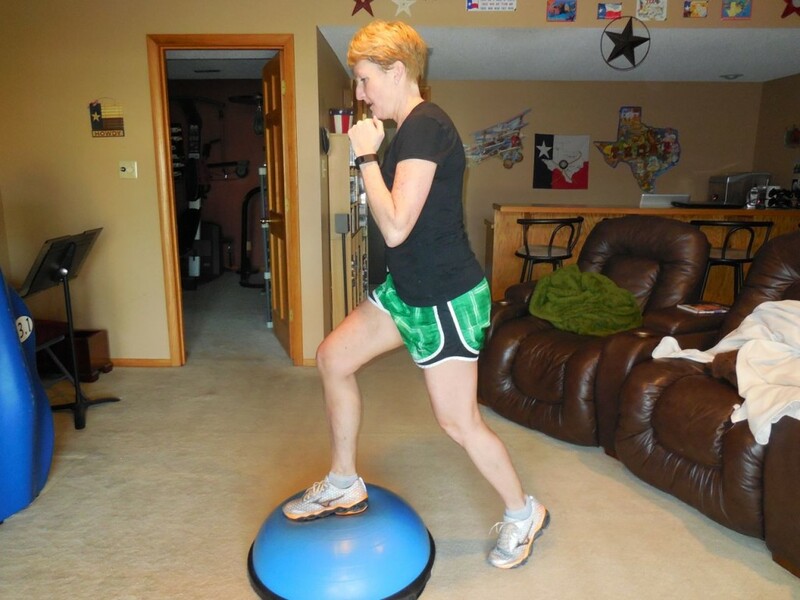 Friday 3/13 – 45 pike and row on BOSU. 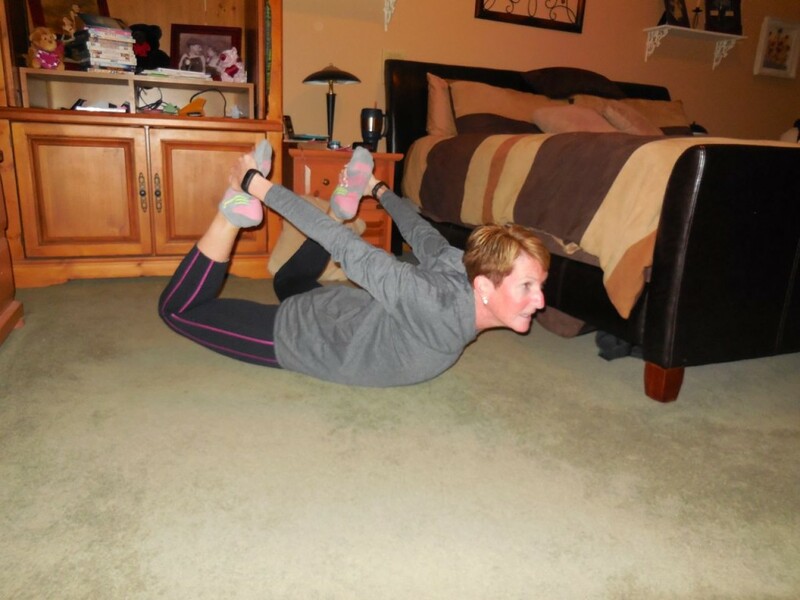 This move is another one that Nellie (Brooklyn Active Mama) shared in her Weekly Wednesday Workout. 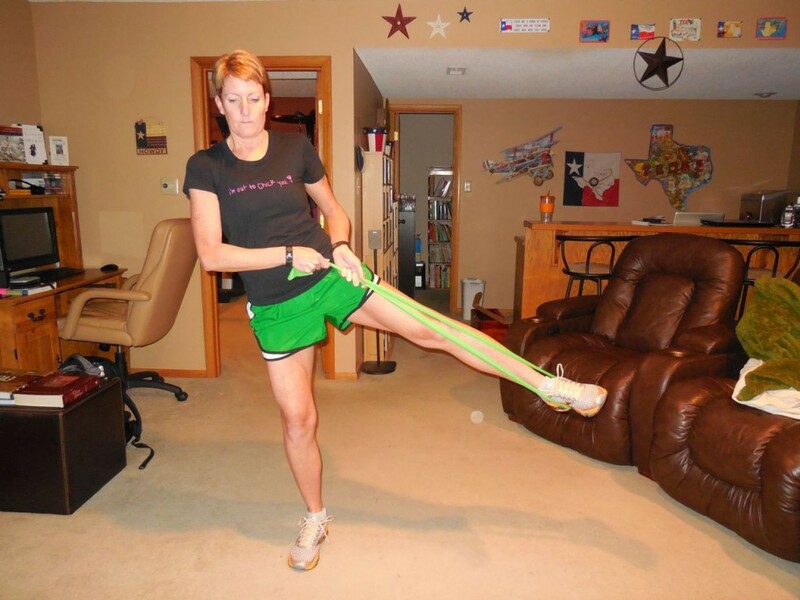 Wrap the band around your foot a couple times – I also ended up choking up on the band to have enough resistance. 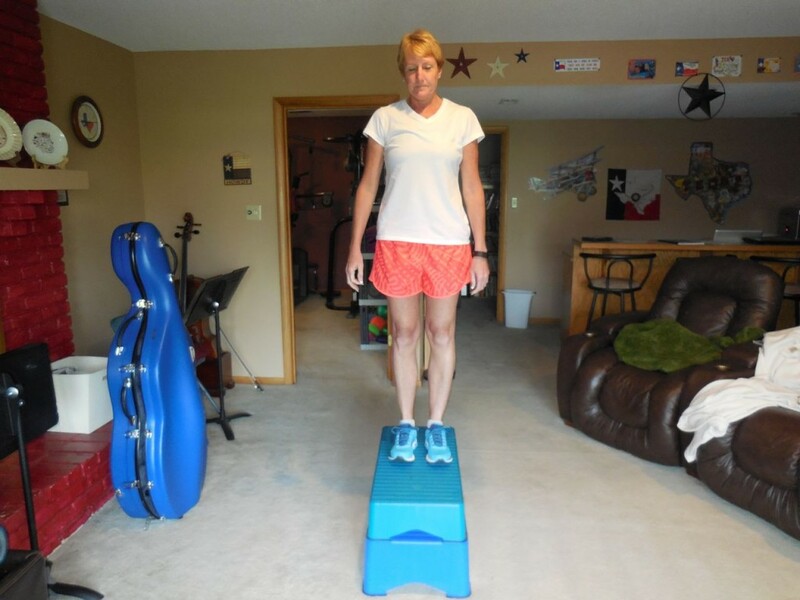 This was a fun move because it worked so many muscle groups and had an incredible balance challenge!!! 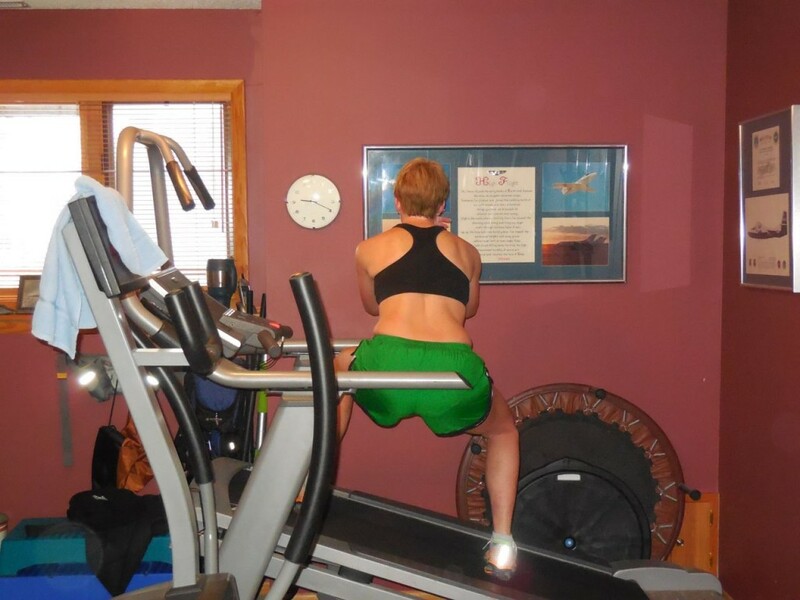 Saturday 3/14 – 45 squats on a 30% inclined treadmill. 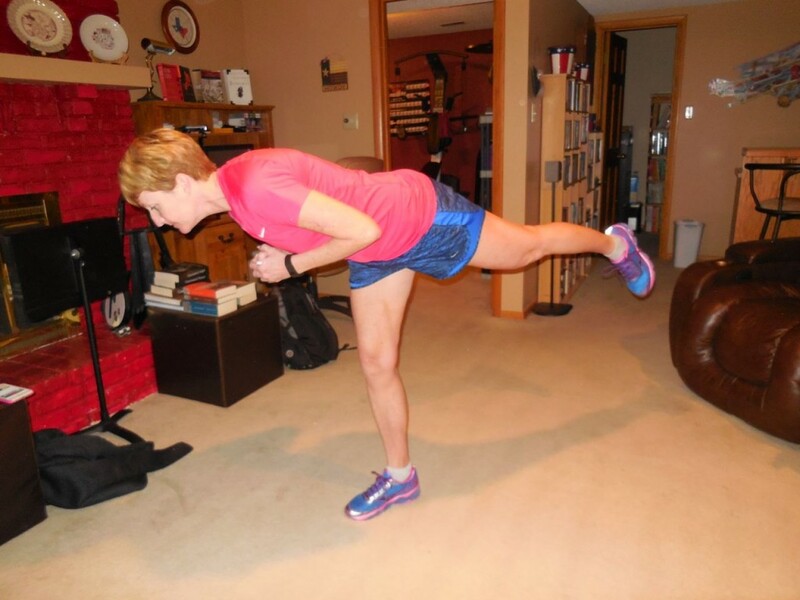 I really liked this move – and it was perfect since I had just finished my run!!! 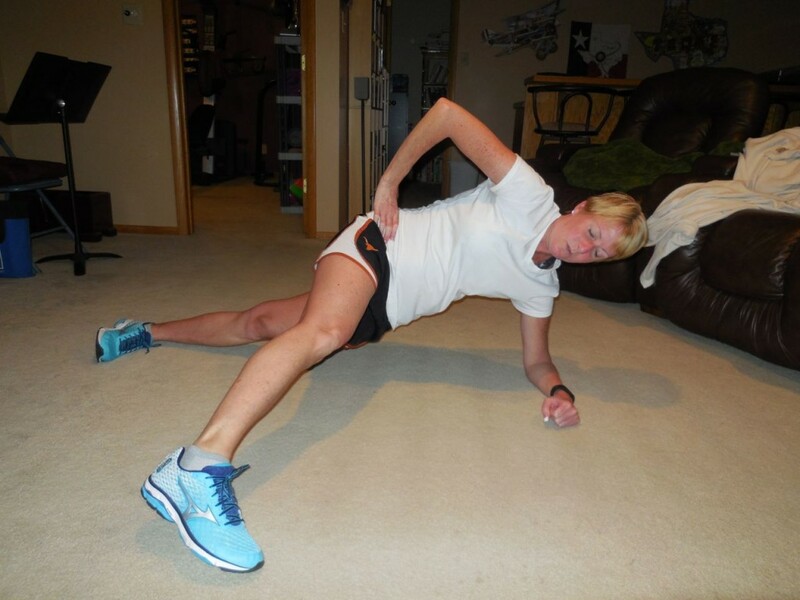 I did this move after running 5 miles – 36:54 followed by a nice easy mile. 4 days out of 7 off is a lot for me but I think it was time to rest!!! This week I got in 2 long runs!!! Next week I have more big running plans so I’m trying to be smart with all of the running!! 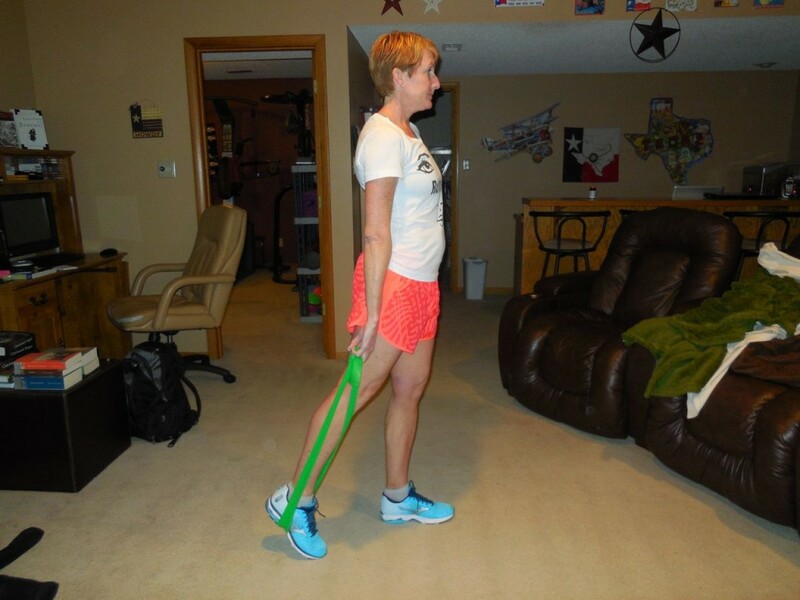 Sunday 2/8 – 45 standing side leg pulses. 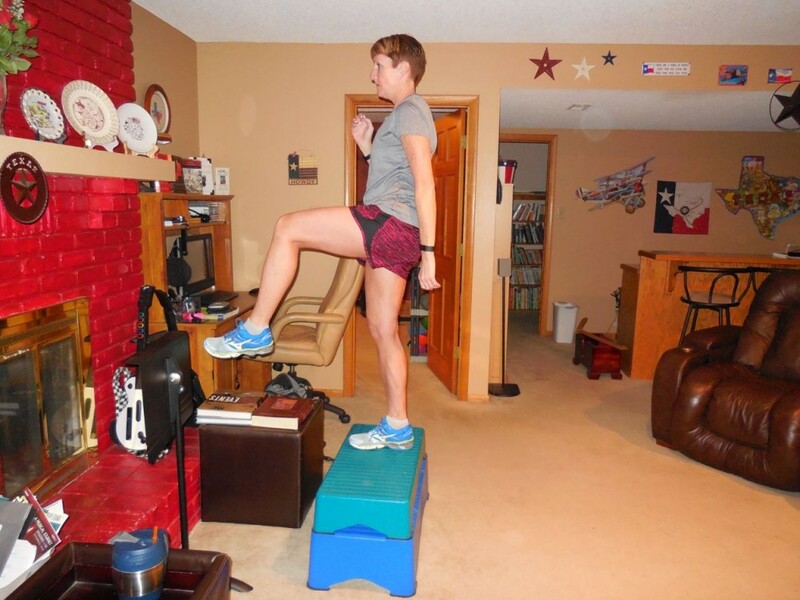 The hardest part of this move was trying to stay balanced while I moved my leg up and down!!! 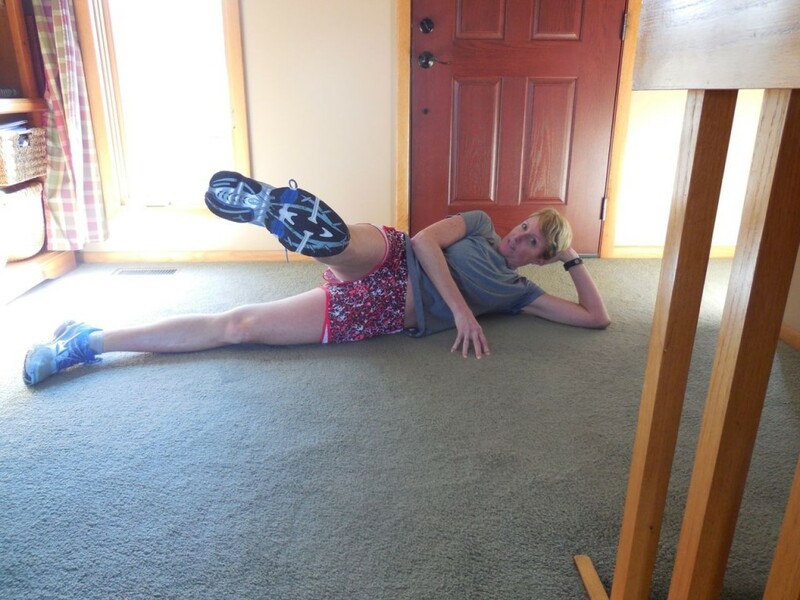 And, of course, I had to do the other leg. Rest day (besides going to the grocery store, doing laundry, sweeping piles of sand out of the garage, washing my truck….). 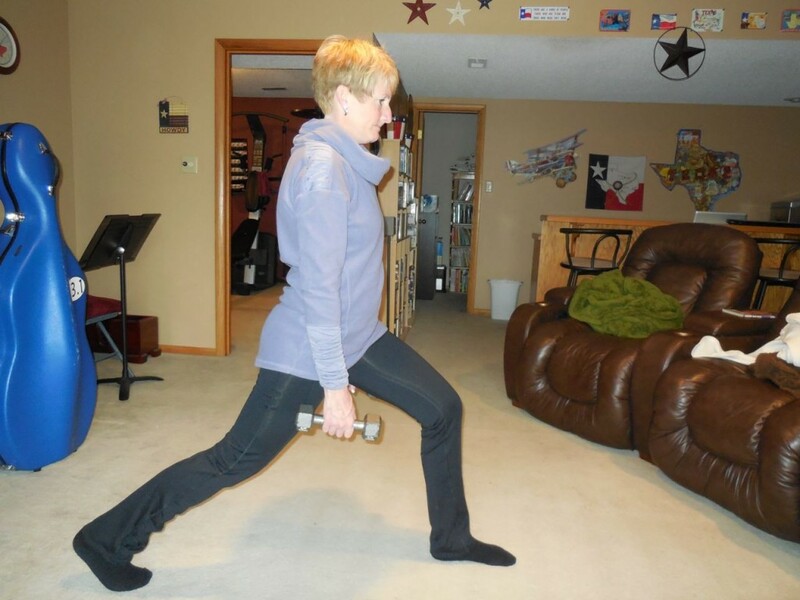 Monday 2/9 – 45 arm pulses – keep arms bent at 90. 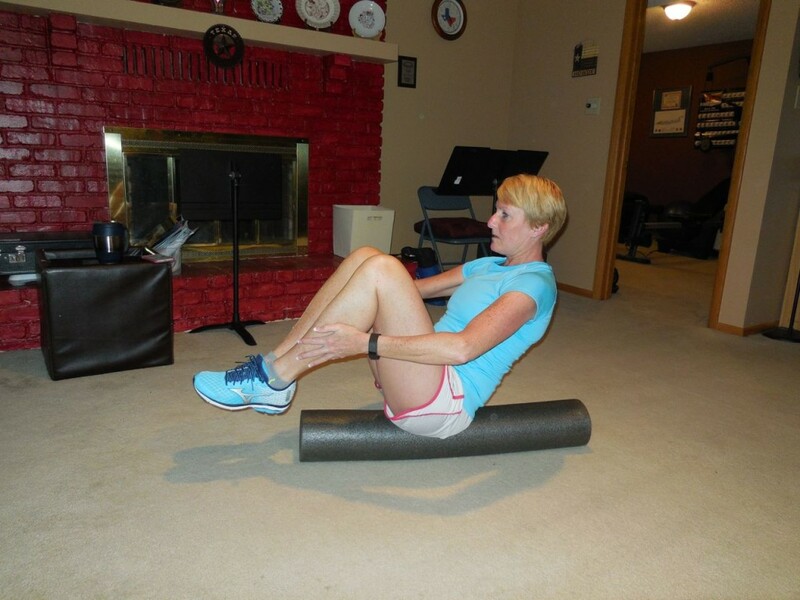 This was another small move but very effective – I felt it in my shoulders, upper back and biceps! 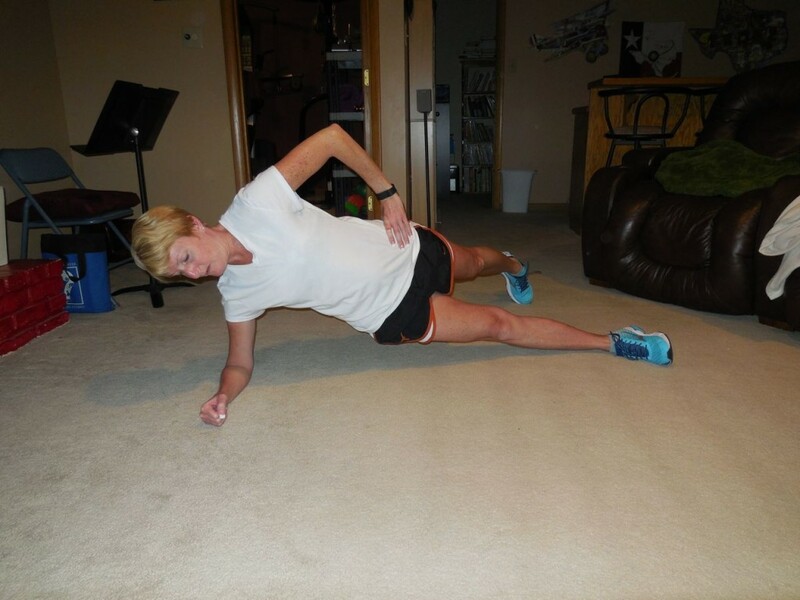 I did Jillian Michaels Hard Body Level 2 – it was hard!!! I also did a 5 mile run (40:12) followed by an easy half mile. 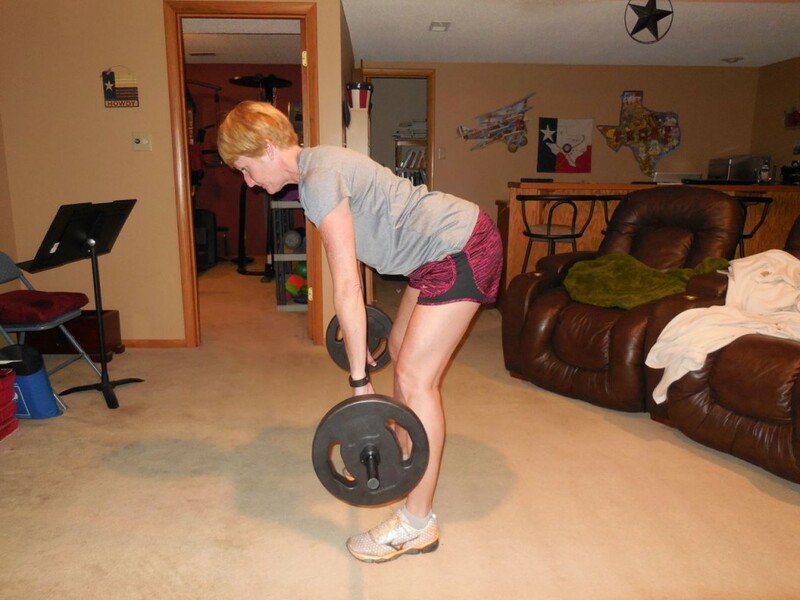 Tuesday 2/10 – 45 squat with dumbbell set-down and pick-up. 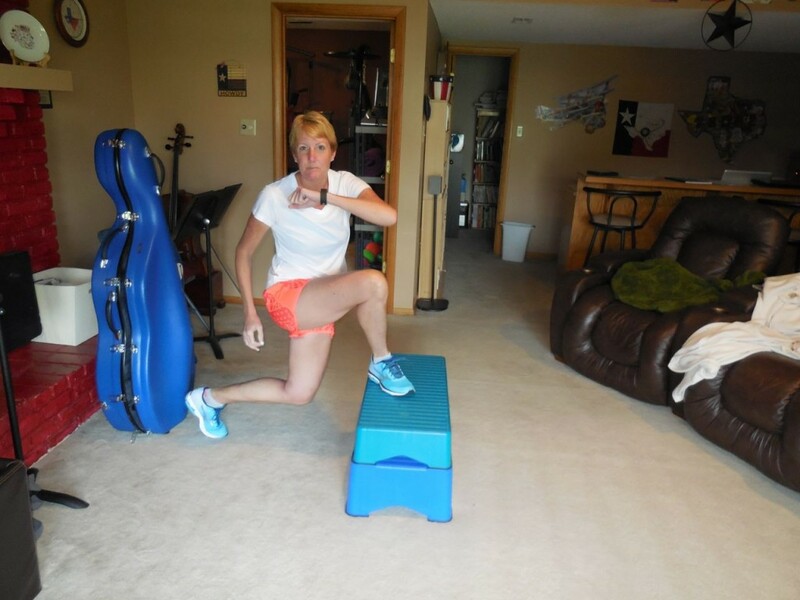 I liked this move – to complete 45 reps I actually did 90 squats!!! This was the first 20 mile run of the week. It wasn’t bad at all!!! 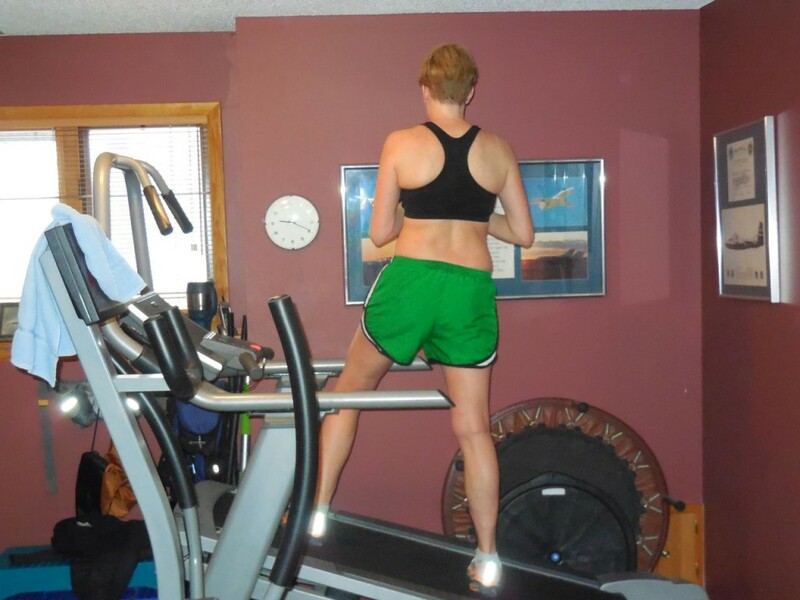 (2:33.56) I tacked on an easy cool-down mile for a total of 21. 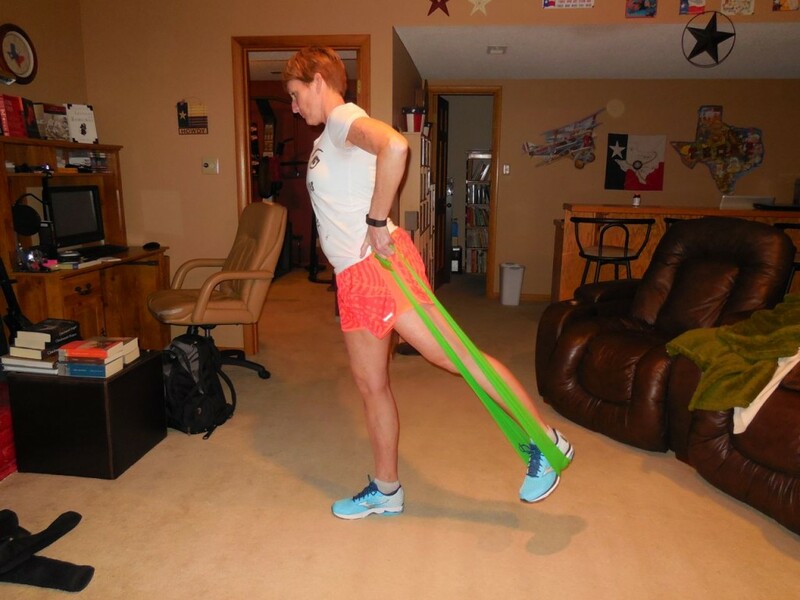 Wednesday 2/11 – 45 back/hamstring stretches. Not gonna lie – this was a really nice 45!!! 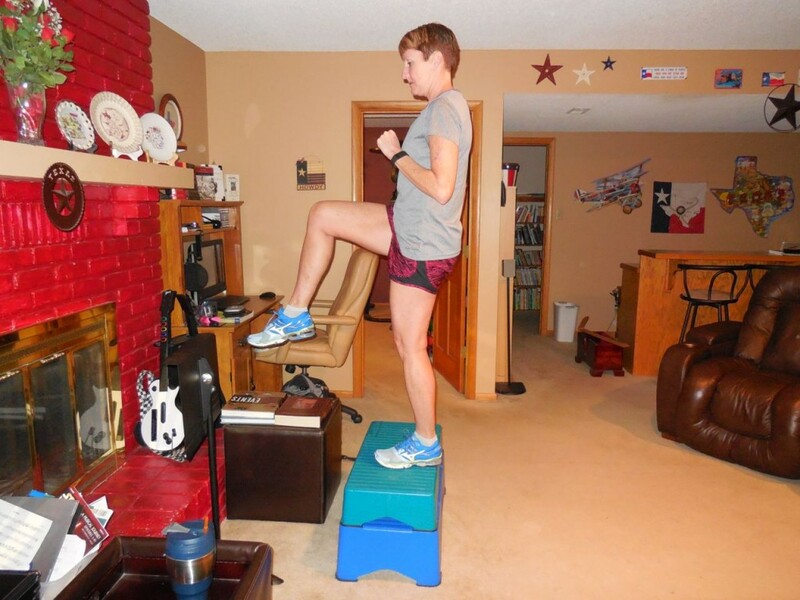 I did a fun workout that was fairly low impact – Turbo Jam, Cardio Party 3. 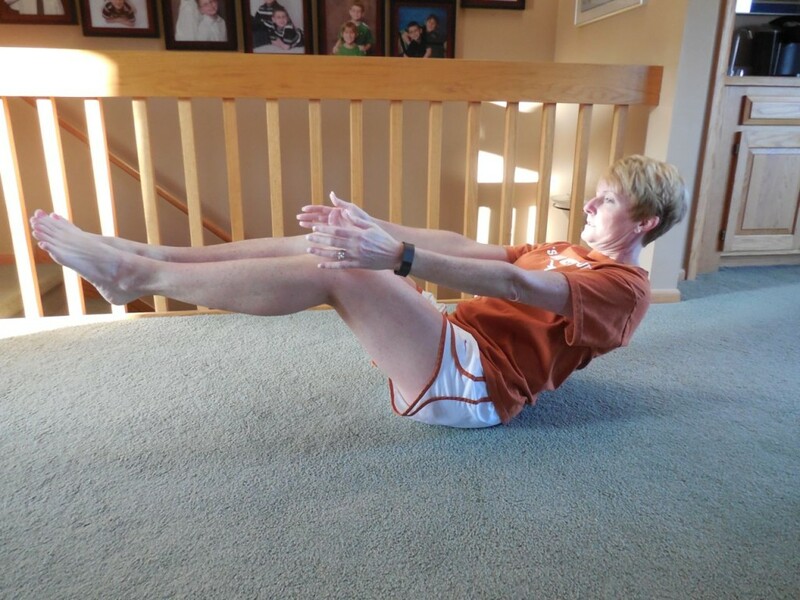 Thursday 2/12 – 45 glute bridge with march (toes up). 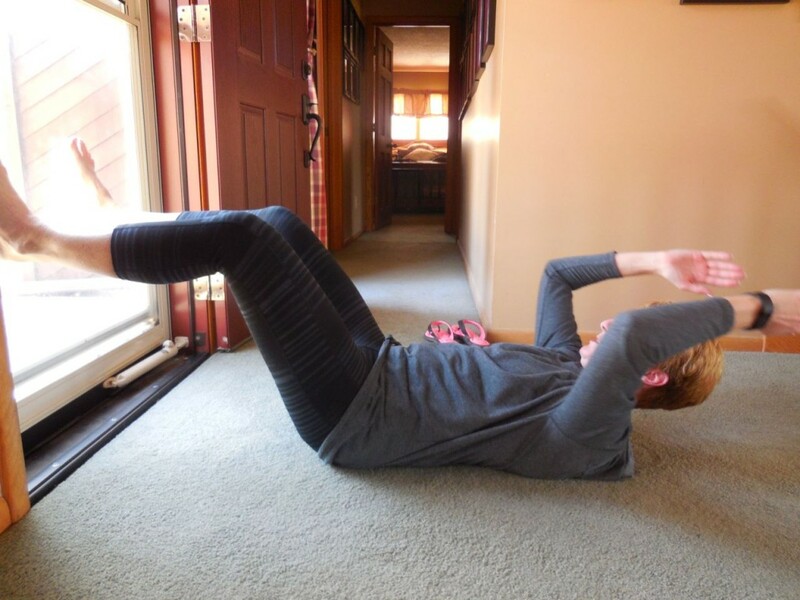 This move I got from Nellie’s (Brooklyn Active Mama) Weekly Wednesday Workout. See why it’s called a “march”? 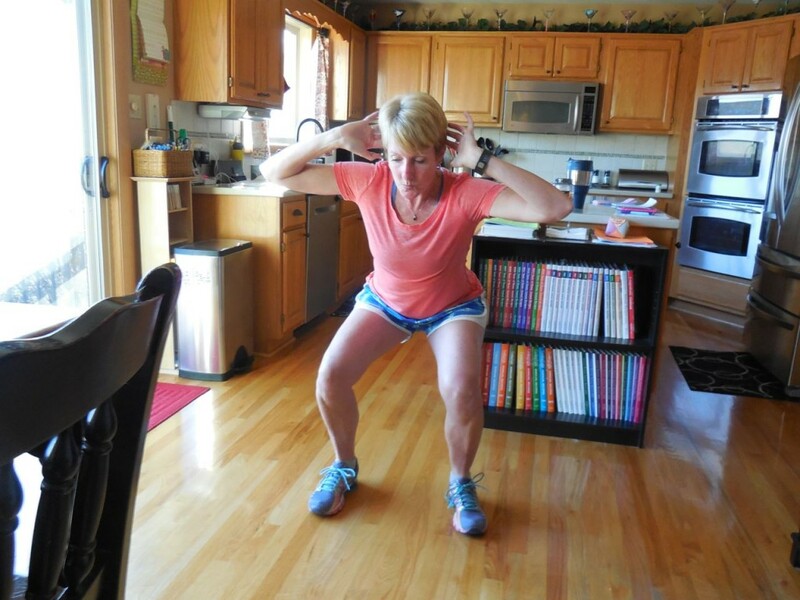 I tried to make sure that I was keeping my hips up the entire time – this was a challenge!! And, I did my 2nd 20 mile run of the week. Funny thing is the time was almost the same (2:33.50) – just 6 seconds faster than Tuesday! I ended up doing 1.5 miles as a cool-down this time for 21.5 total. 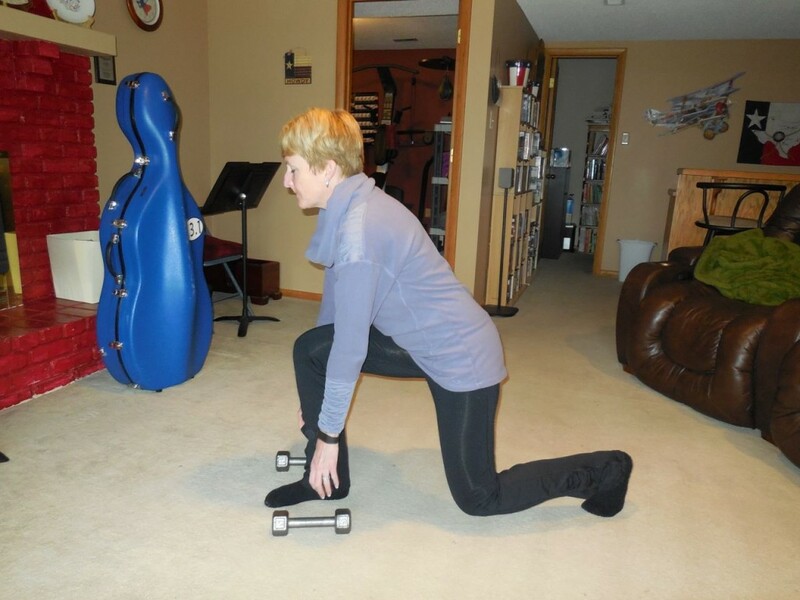 Friday 2/13 – 45 side lunge skaters – staying low the entire time. 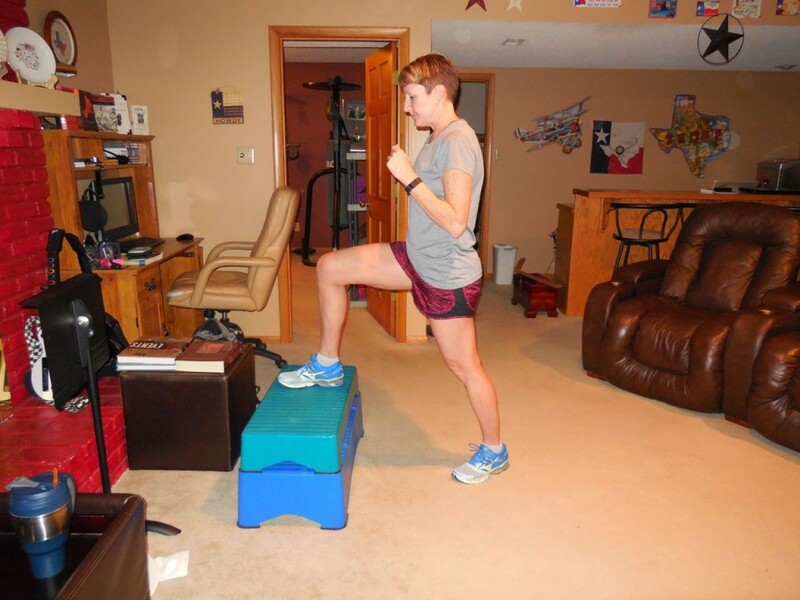 The goal on this move is to stay low and work your quads the entire time. 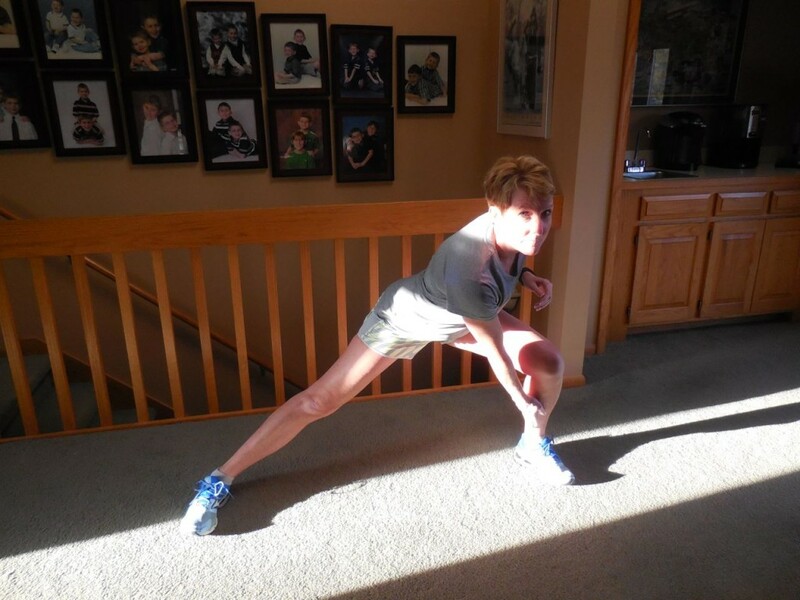 (a right-left lunge = 1 rep) And, I stood in the sunbeam – because it was warm!!! 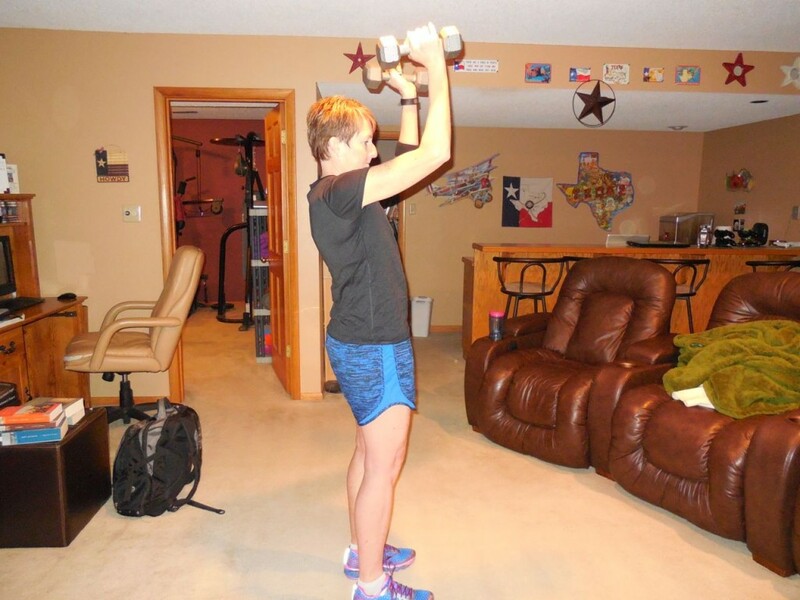 I did a workout I hadn’t done in awhile – Denise Austin – Get Fit Fast. 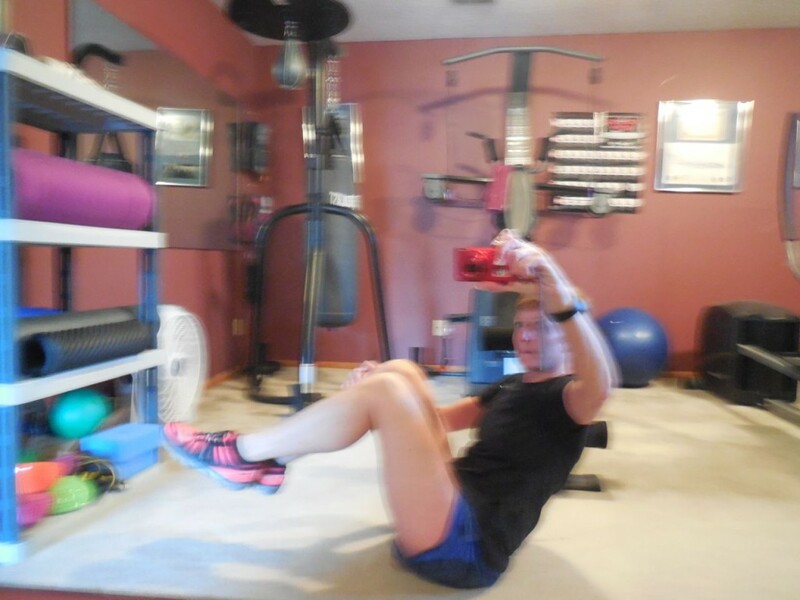 One thing I really like about Denise Austin’s workouts is she features “real” looking people – people who look like me with hips and not a 6-pack!!! 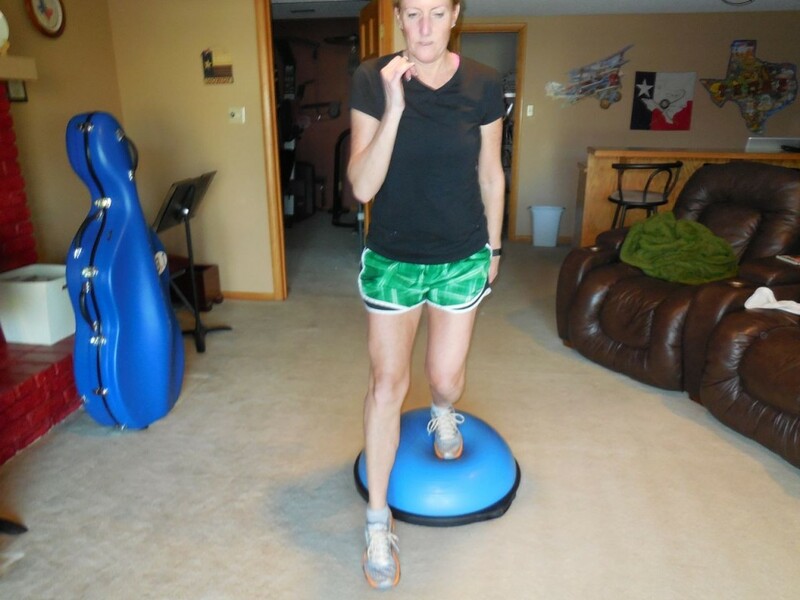 Saturday 2/14 – 45 dead bugs while on wobble ball with shoulders slightly off ground. Today was my final run of the week – 5 miles in 39:21 followed by an easy cool down mile. I’m happy that I met my running goal for the week – 50 miles hard and 4 easy miles to get over the 50 mile mark for the week. The next 2 weeks I’m hoping to get my mileage a little higher and then I will ease up some. Happy Saturday!! Happy Valentine’s Day! This week has been a much stronger week of workouts! I’m hoping to start getting in a few mega runs soon!!! 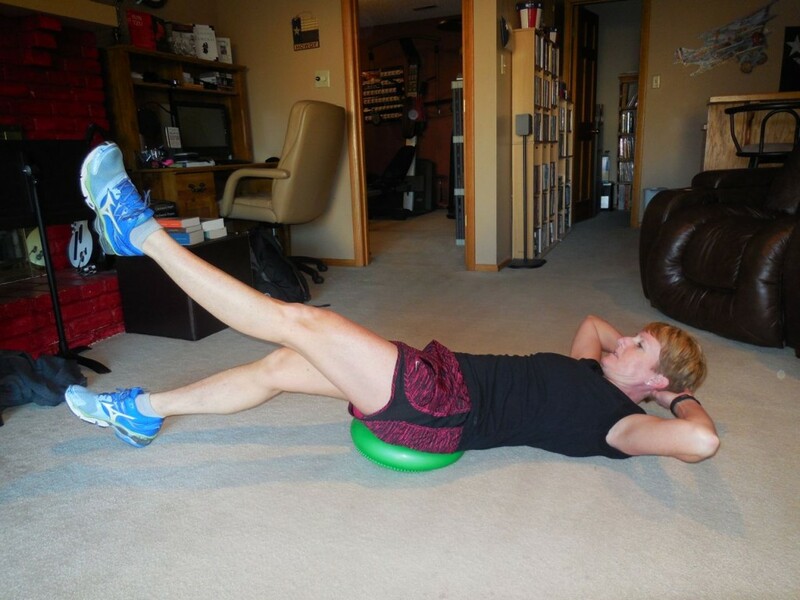 Sunday 1/11 – 45 supine rolls, great for your core and also your upper back. I got in a 6 mile run (45:01) at a faster pace than I had been running for awhile followed by an easy mile. 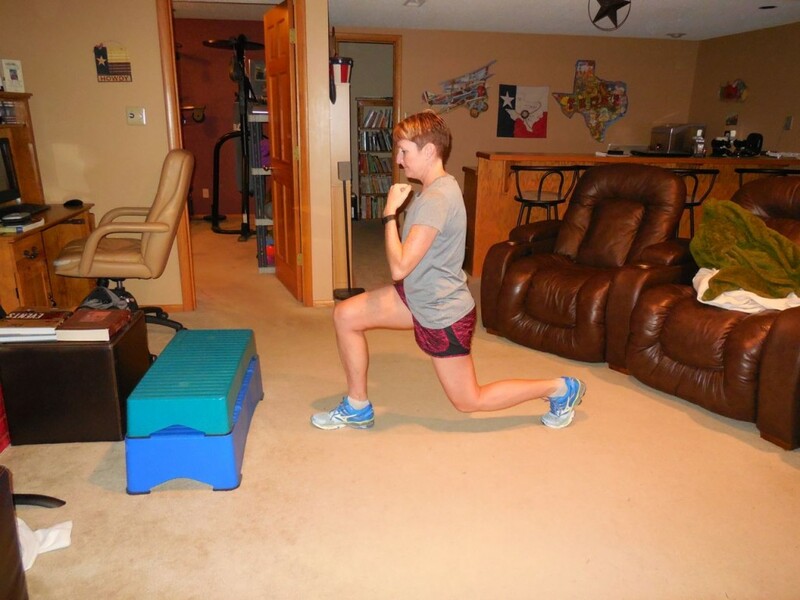 Monday 1/12 – 45 double knee in to a full body extension with arms extended. I did a DVD that I don’t do often but it really is a good one – MashUp Conditioning. 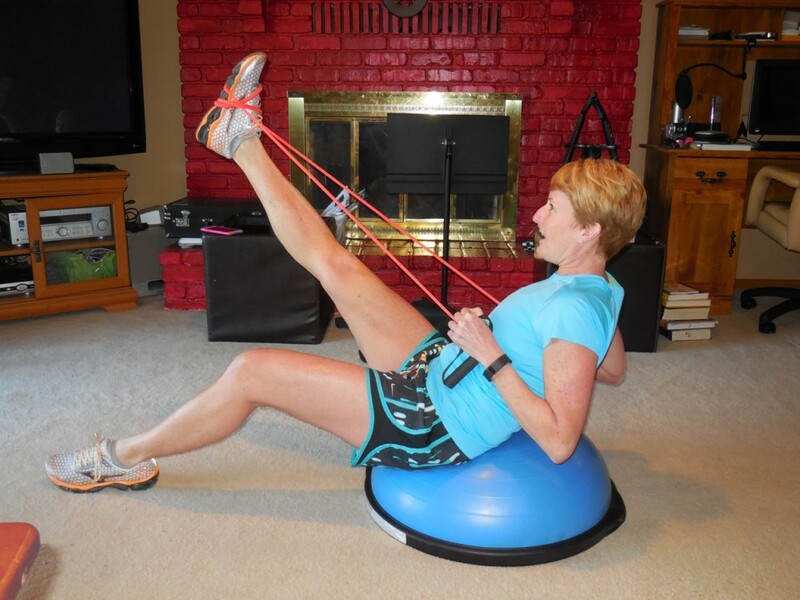 This DVD has 7 different workouts (called Tempos) that are 15 minutes each. Each segment has strength, HIIT, core. I did Tempos 5,6 and 7. 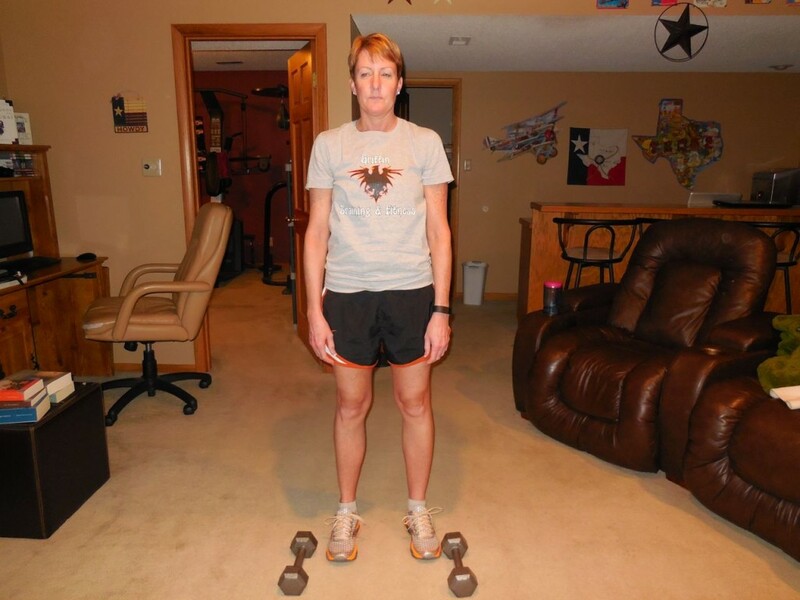 Tuesday 1/13 – 45 plies with heels up. 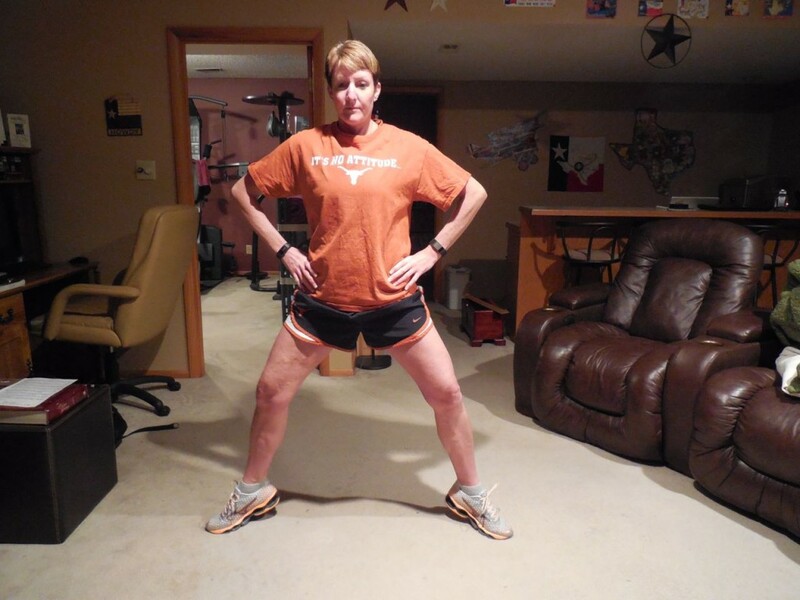 I always love the feeling in my inner thighs when I do plies!!! I ran 10 miles!!! 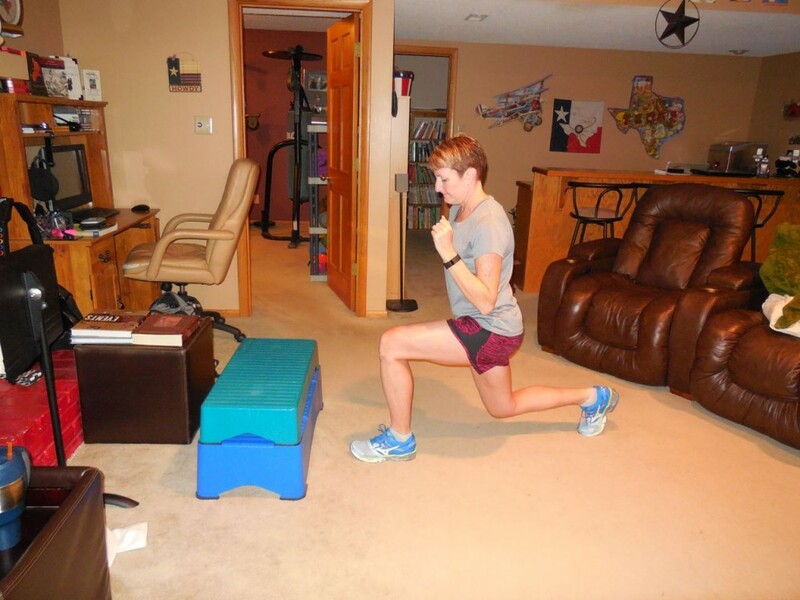 (75:33) I finished off the workout with an easy mile. 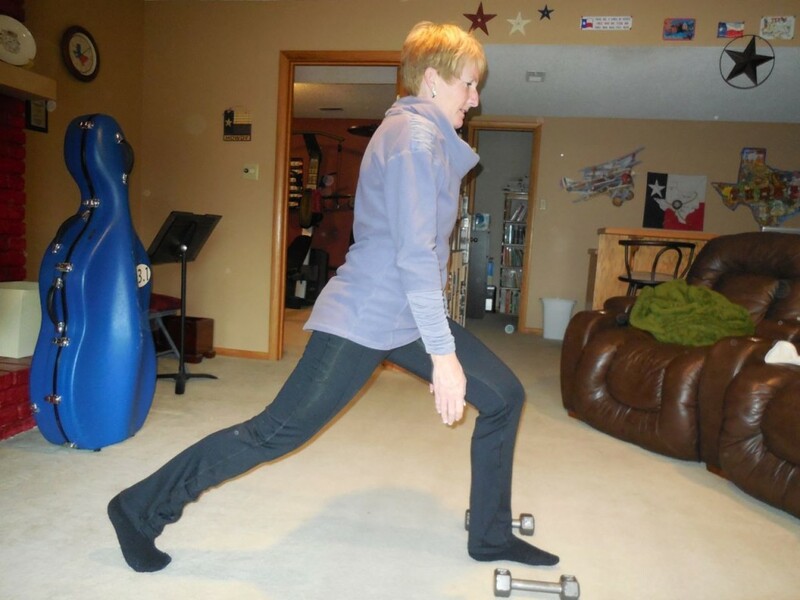 Wednesday 1/14 – 45 step-up to knee, step down and lunge back. 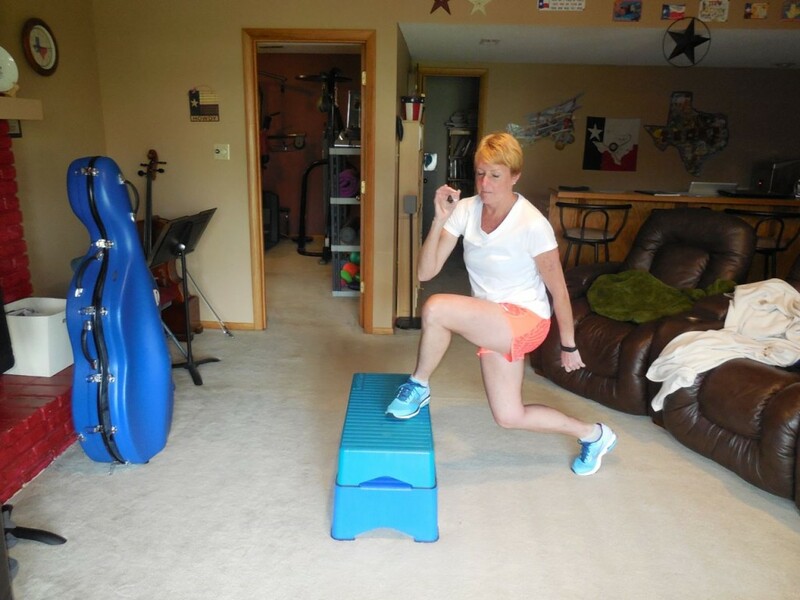 This move is similar to one that Josie (YumYucky) did – stairless step climbing. 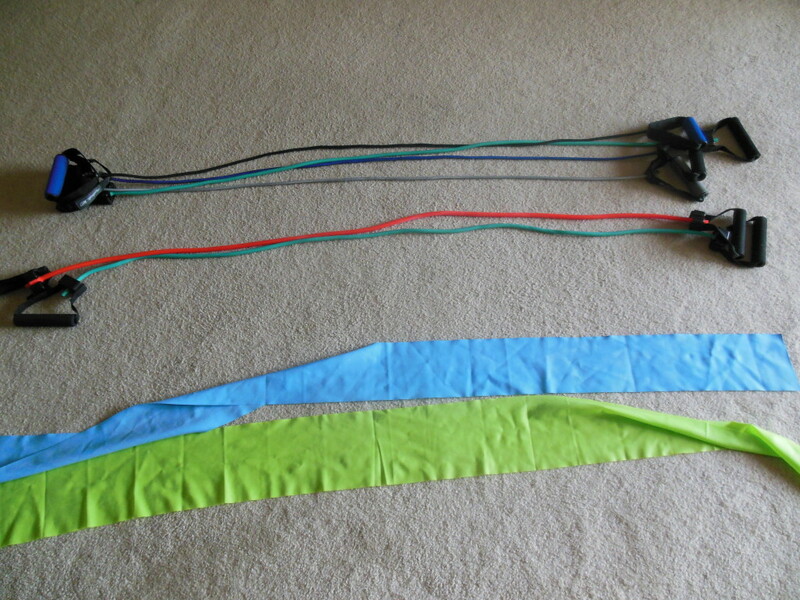 After I did 45 like that and had shaky legs, I switched the whole pattern for another set!! 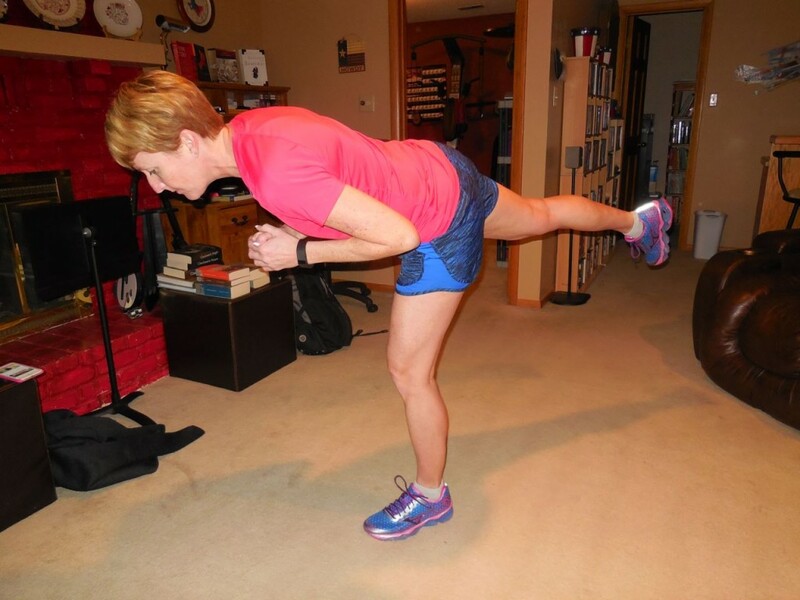 Fun move – and my heart rate really got up since it is all lower body work. I also walked 2.45 miles with a 10% incline (had some DVRed shows to catch up on!!). 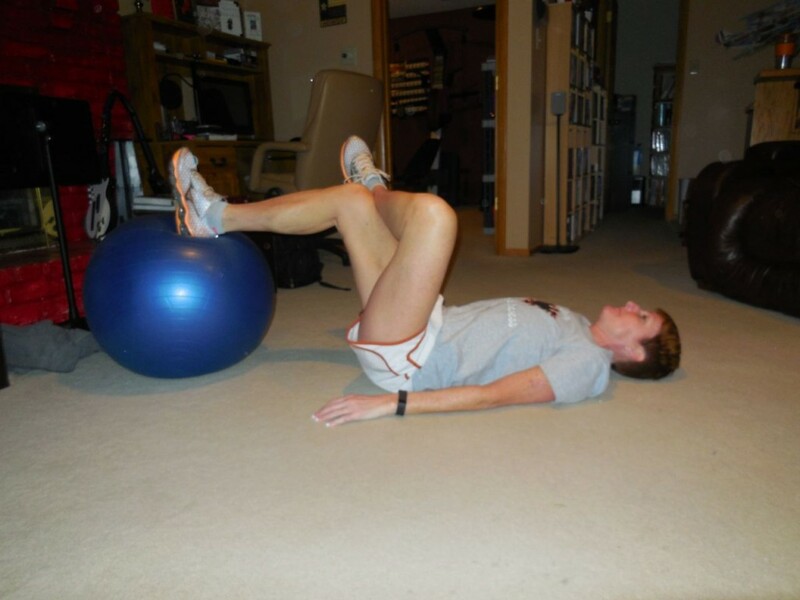 Thursday 1/15 – 45 single leg bridges with one leg crossed over the other and the supporting foot on a stability ball. 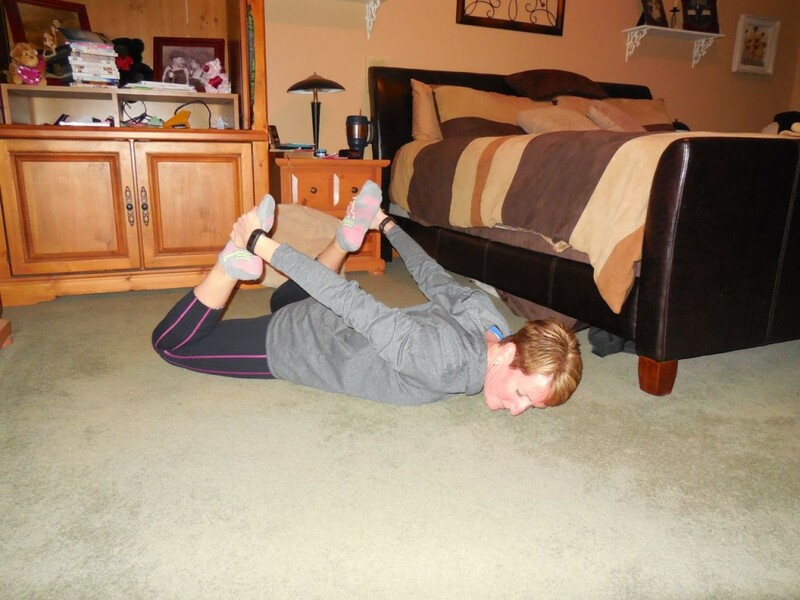 This move is from Nellie’s (Brooklyn Active Mama) weekly Wednesday workout. YIKES!! This move was hard!! Probably why my hamstrings are sore today (2 days later!!). This was another day of running – 8 miles in 59:37 followed by 1.75 easy miles. Friday 1/16 – 45 side leg abduction with band. 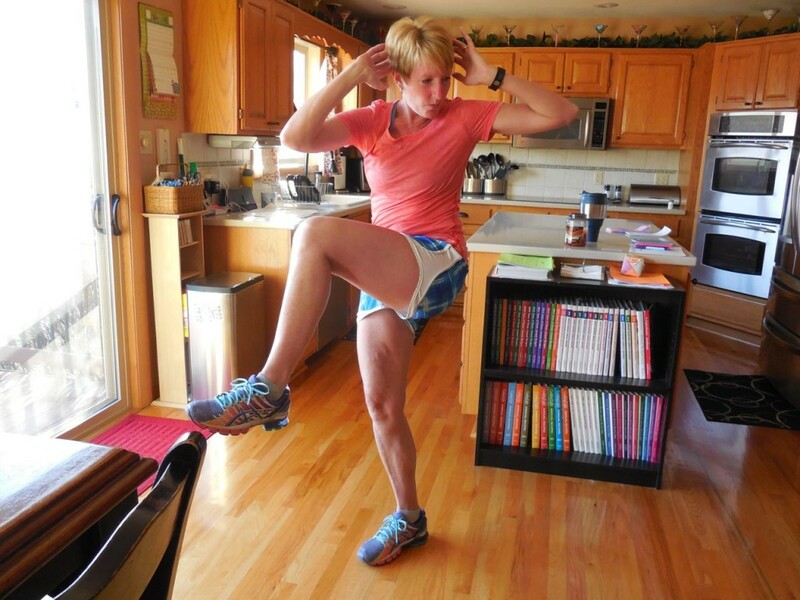 I love moves like this because while it works the hip of the leg lifting, the standing leg also starts shaking!!! 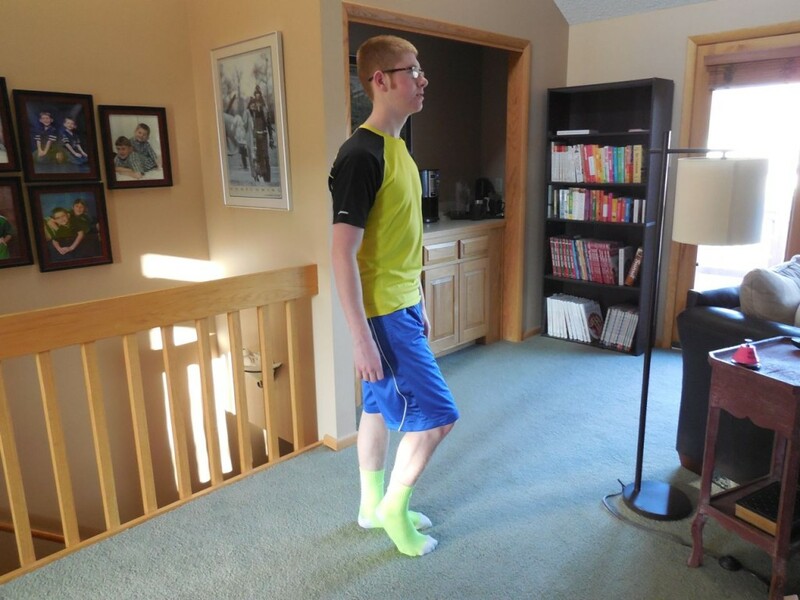 I don’t know if you can tell but while I lifted my leg I also pulled on the band for some extra resistance. 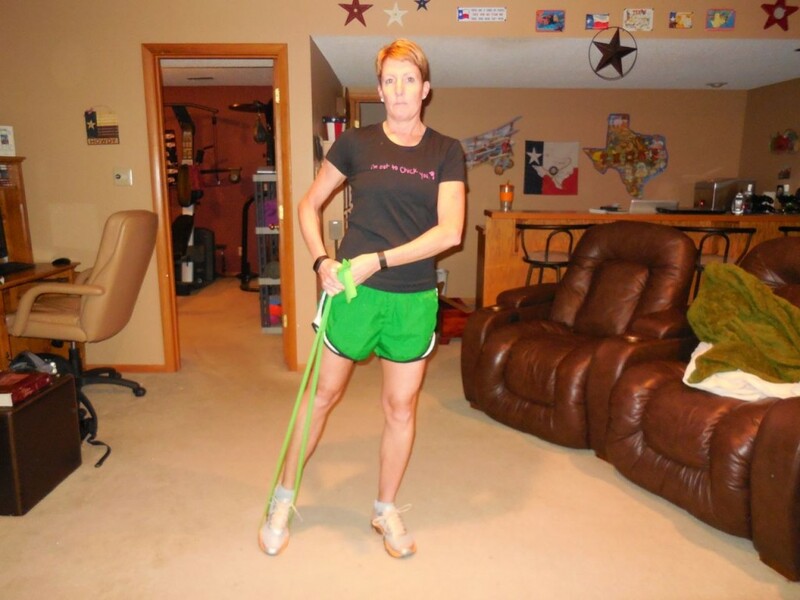 I did Denise Austin’s Personal Training System. 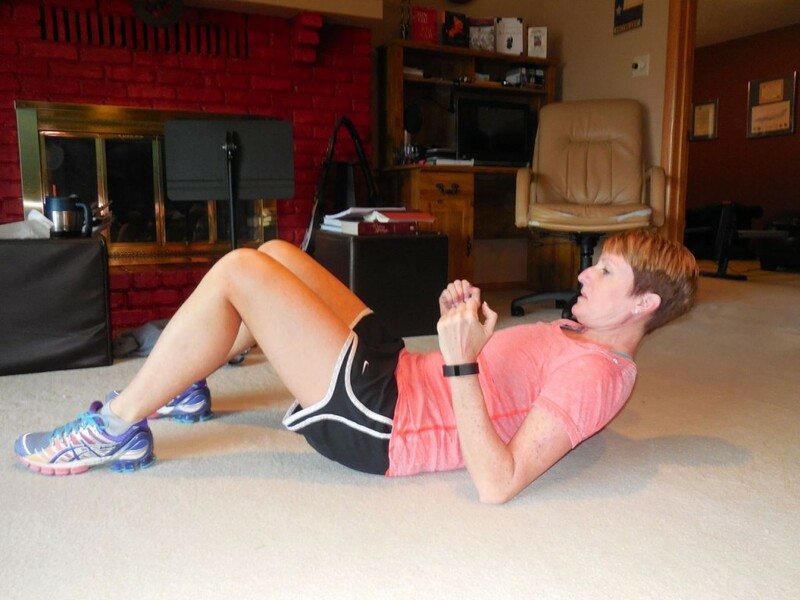 This is a full body workout with about 20 minutes of cardio followed by 10 minutes of lower body, 10 minutes upper body, 10 minutes core and 10 minutes of stretching. Saturday 1/17 – 45 bow lifts. Pretty sure this is the first time I’ve ever done any of the pictures in our bedroom – I have to stay out of the light today and this room is one of the best choices. Overall this was a really good week of workouts. 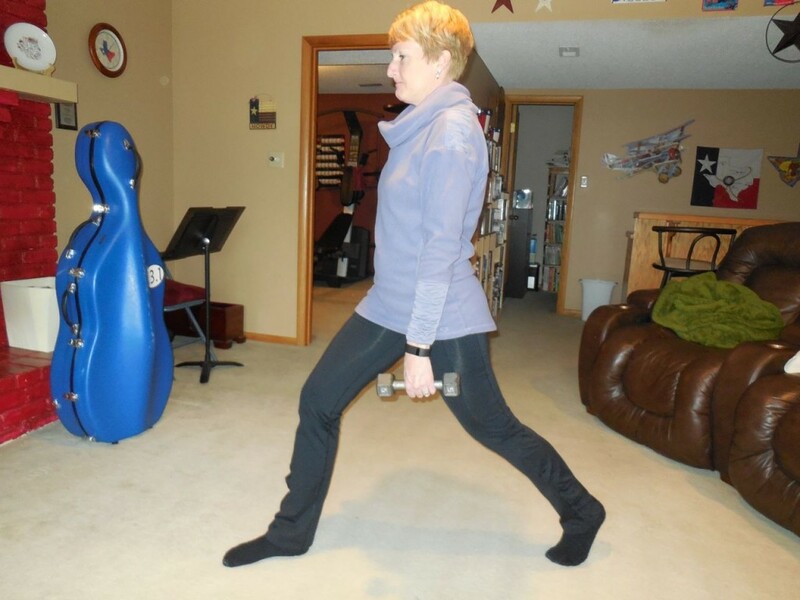 I’m still incorporating a lot of the moves from physical therapy into my workouts – just amping them up a little. And, my running speed is starting to pick back up!! Now I think I’m ready to slowly increase my mileage again! !